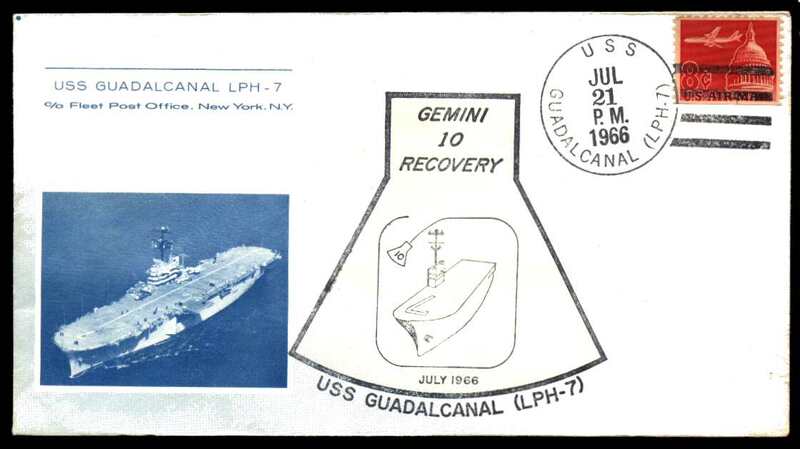 There has been much discussion, not to mention confusion, over the years as to what constitutes a Captain's cover and a Crew cover for a Primary Recovery Ship (PRS). Different authors have used different definitions. 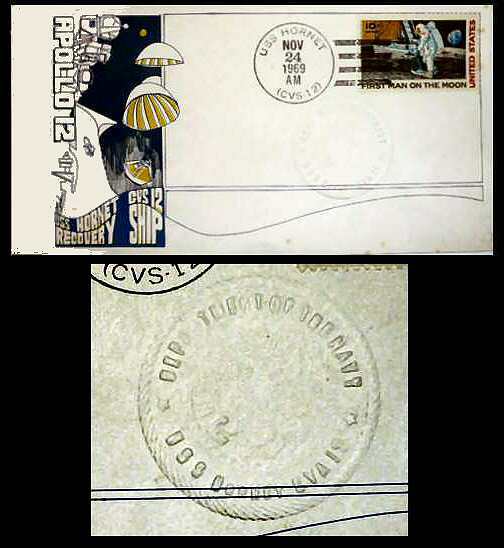 Another limiting factor has been the lack of information on the exact circumstances of issue for some covers. Most definitions have also left out interesting and often important covers. I have therefore developed a set of definitions which cover all such covers. While these are based on those already in use, there are some differences. I have also found it necessary to develop definitions for more than one type of each cover. See PRS Crew Size for information on the size of the crew for these ships. These are specially designed covers prepared at the direction of the ship's Captain. They are usually aboard the ship and are sometimes signed by the Captain. They were distributed free to various members of the crew and dignitaries. This is largely based on the Space Unit definition. These are covers with the Captain's corner card and/or have been signed by the Captain. They may or may not include a ship's cachet or other special cachet. This is largely based on the USCS definition. 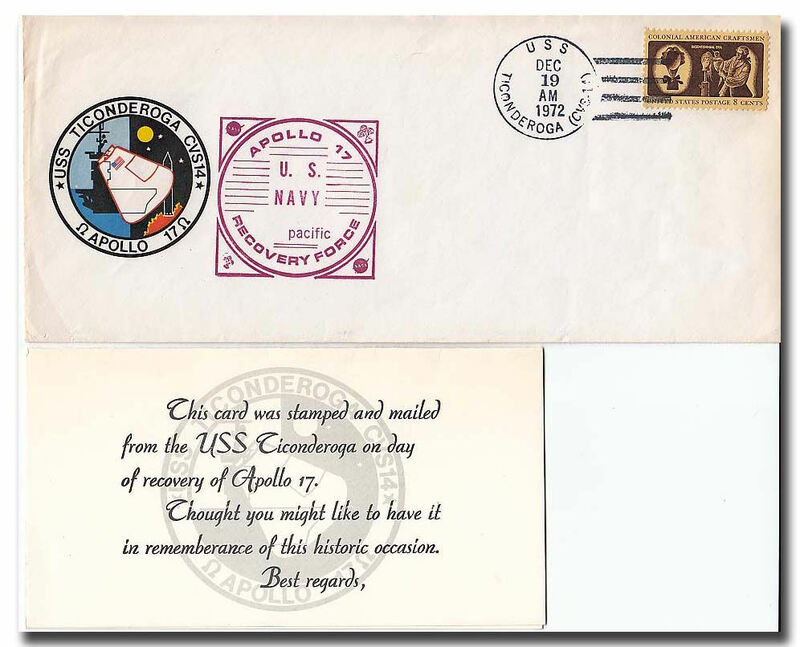 These covers are specially designed covers usually prepared at the direction of an appropriate member of the crew (such as the Postal Officer) and distributed or sold to members of the crew. 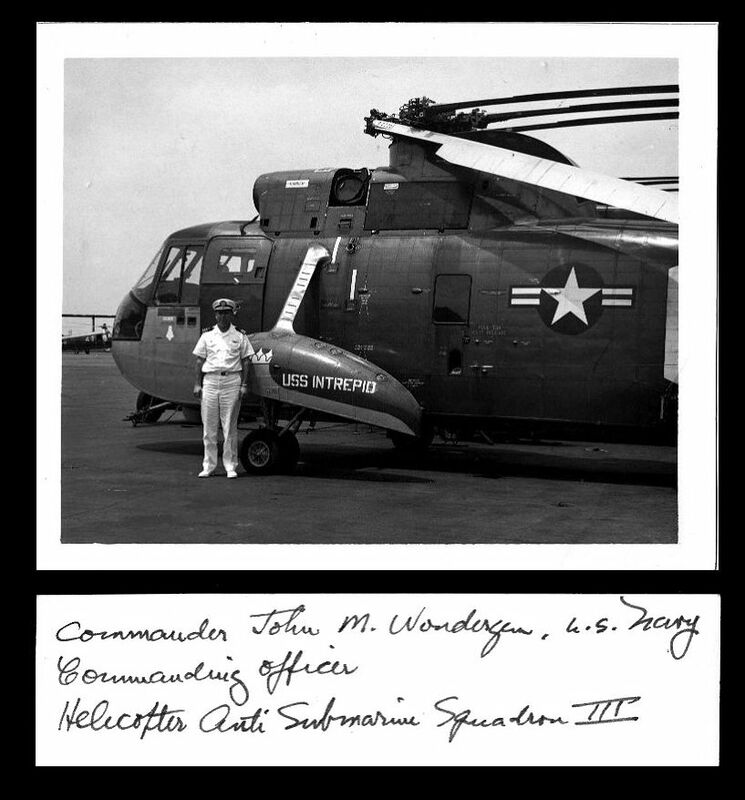 While often aboard the ship, some were privately ashore. Most if not all PRSs and Destroyers had their own stationary which was available for purchase by members of the crew. 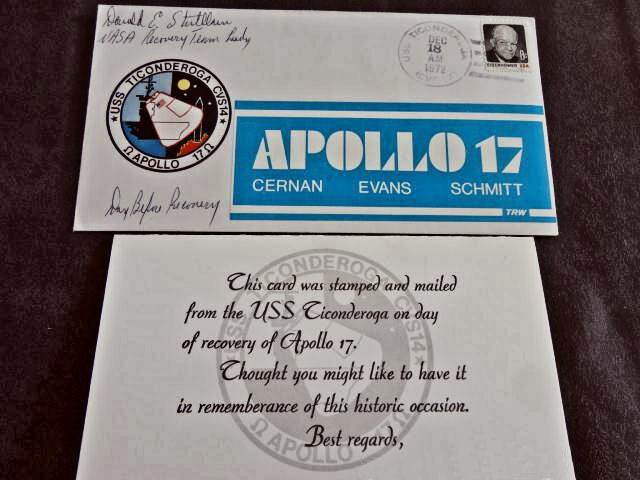 Thus it was possible for a crew member to produce a 'crew cover' by having the ship's stationary stamped with the ship's or other cachet and postmarked. Also applies to covers designed by an individual crew member for their own use. 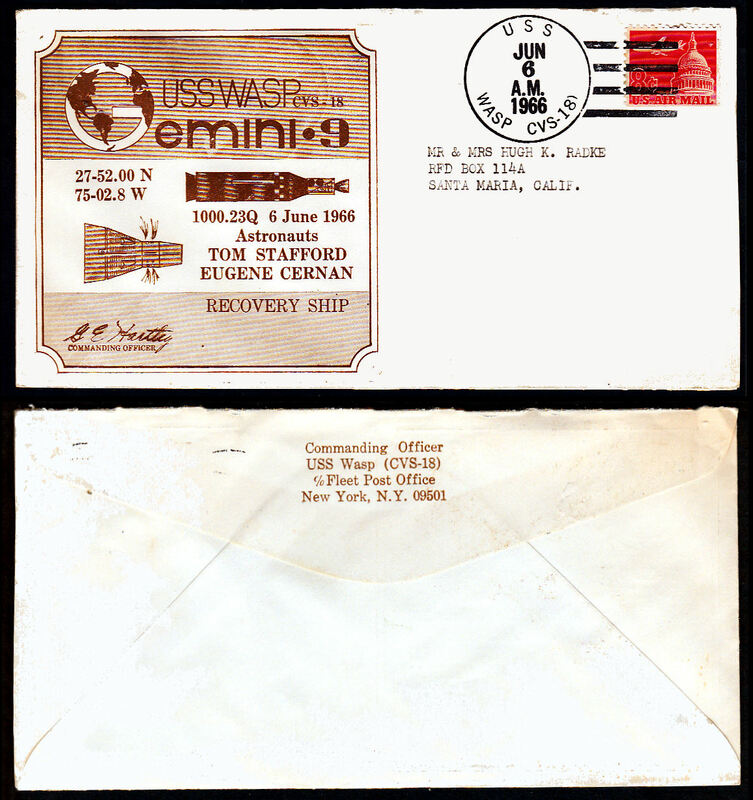 These are covers from a member of the crew using a 'standard' envelope (ie not ship's stationary). It may or may not have a RSC. 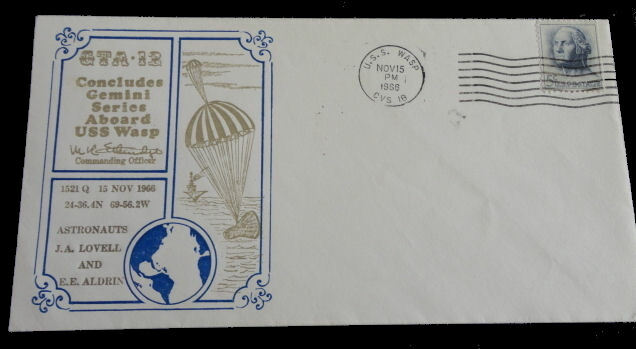 A special case of crew covers are those produced by Morris Beck. 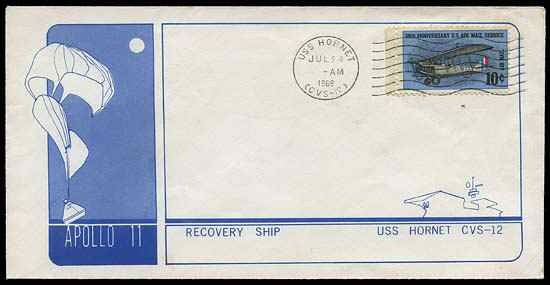 Morris Beck, who had been designing Naval covers for some years, started designing Recovery Ship covers towards the end of the Mercury program. 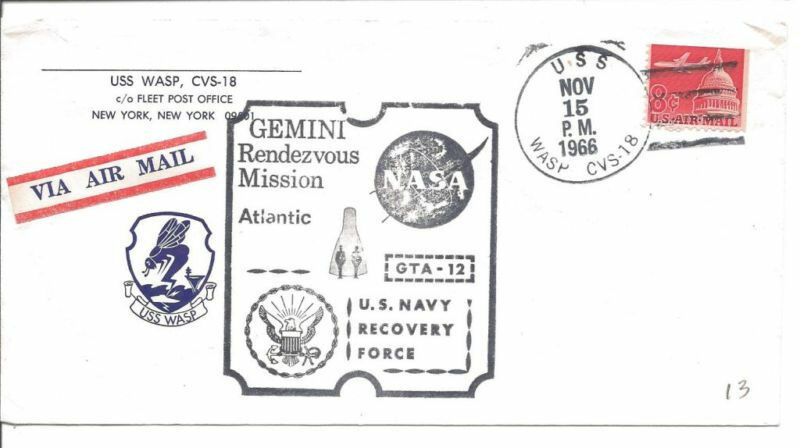 By the start of Gemini he was producing covers for most of the Recovery Force ships. 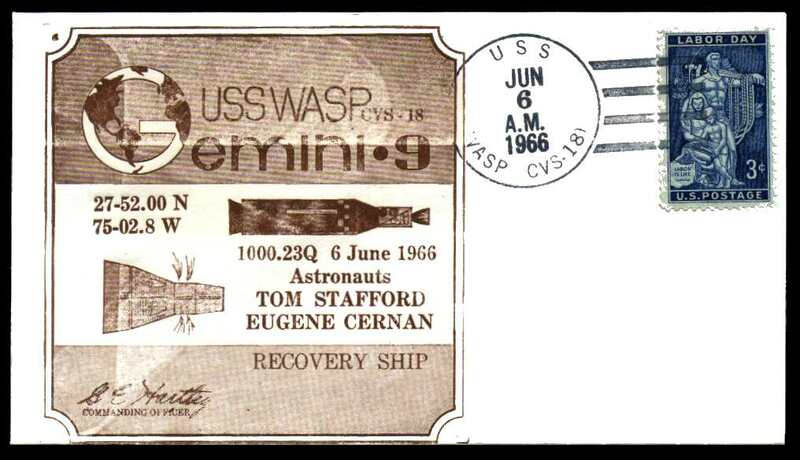 He started by producing 300-400 covers per ship which increased to 500-600 per ship for Apollo, 800-1000 for Skylab and several thousand for ASTP. 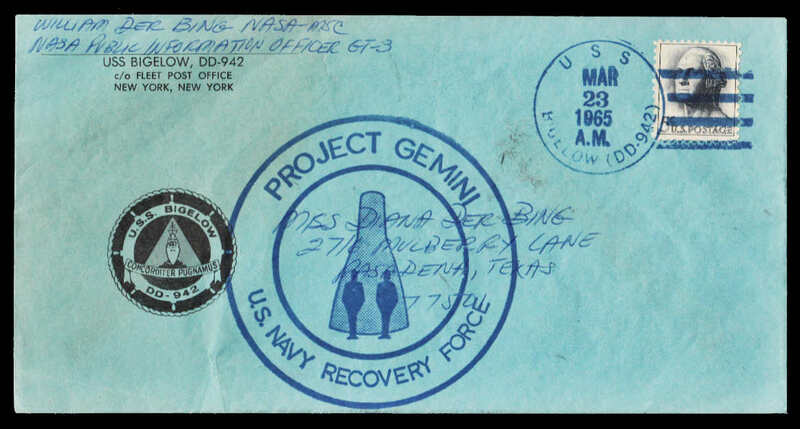 These covers were numbered with a Bxxx number between 1 and 999 (they were part of his overall series of Naval covers) with each ship in a mission being assigned covers with a different number (note that occassionally a ship would received covers from more than one group). 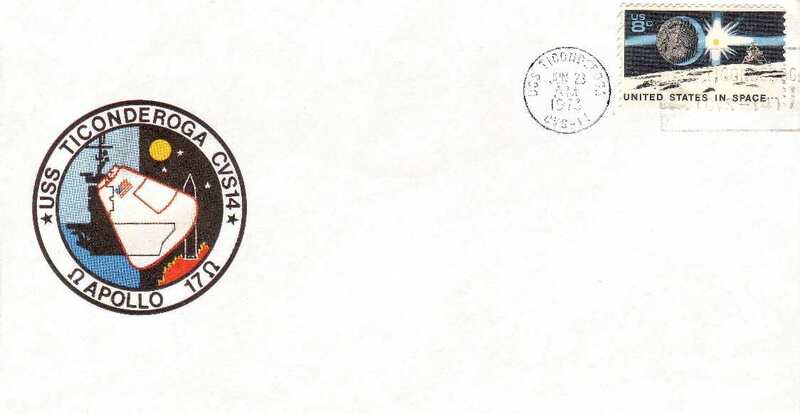 As a thank you to the each ship's postal officer he produced 25+ covers without a number which he gave to the Postal Officer to distribute as he saw fit. As most of these have been lost over the years or tucked away in someone's attic they are quite rare and worth considerably more than the standard Beck covers. As these are identical to the standard Beck cover, except for the absence of a number, only one example (for GT-3) will be illustrated. 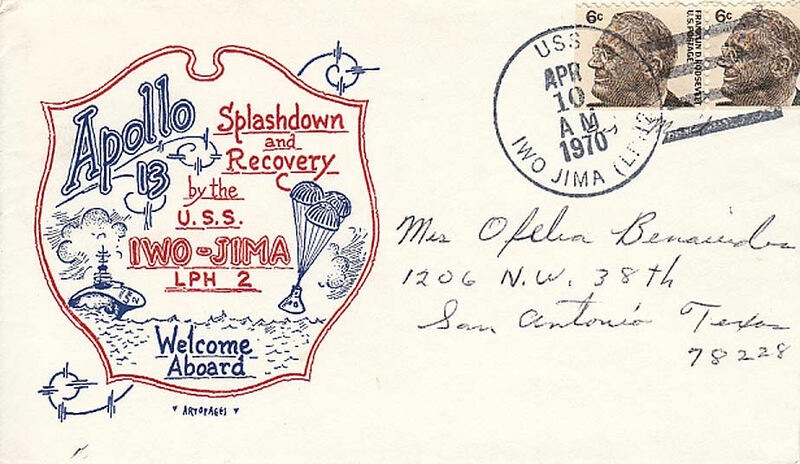 This catagory includes covers produced for or by a dignitary who was aboard the ship. 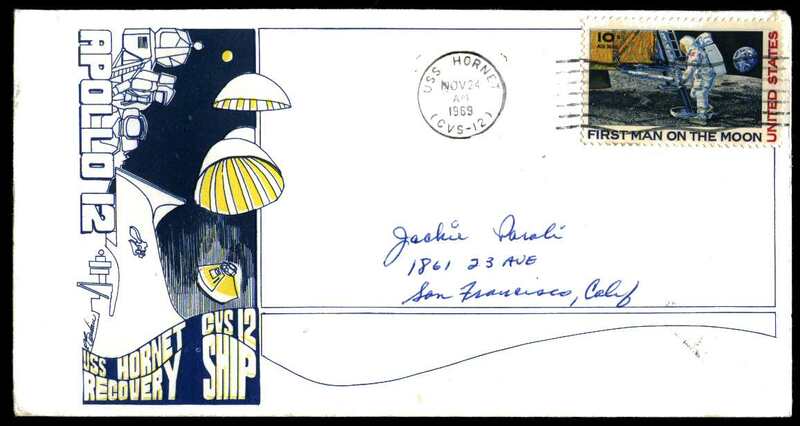 An example is Admiral's covers. 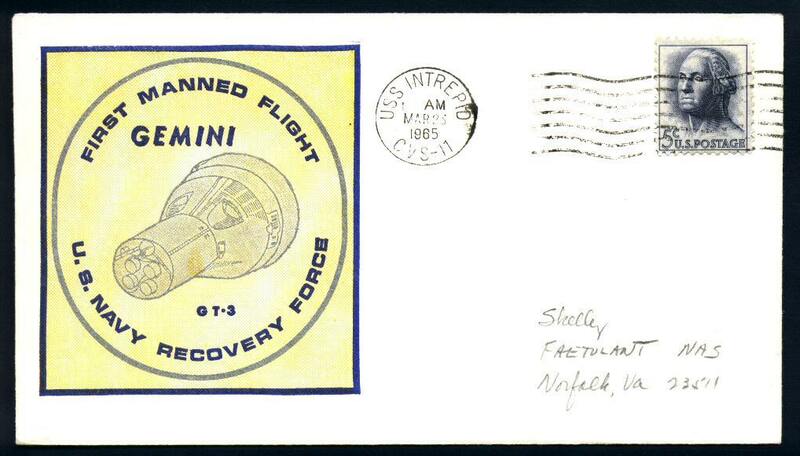 This catagory covers all other covers which were especially created aboard a PRS for a recovery mission. In the following table I will refer to Captain's Covers Type 1 as Captain's Covers for brevity. 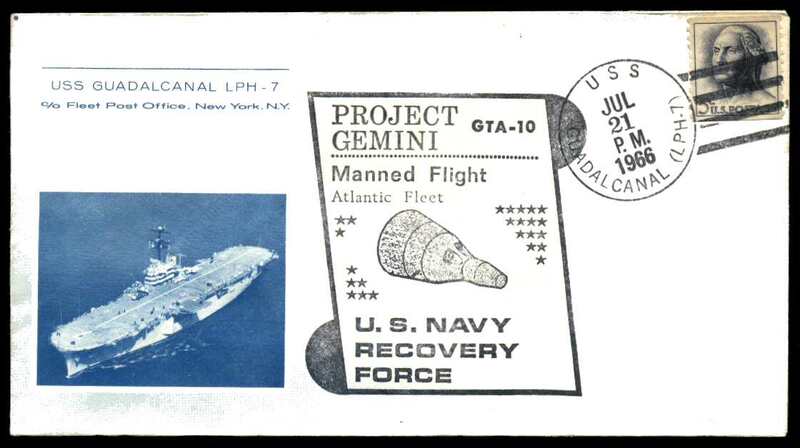 Designed for the USS Randolph which was the designated PRS, it used a label cachet which was glued to the cover. Most of these labels have brown gum toning. Many such covers were signed by the Captain. 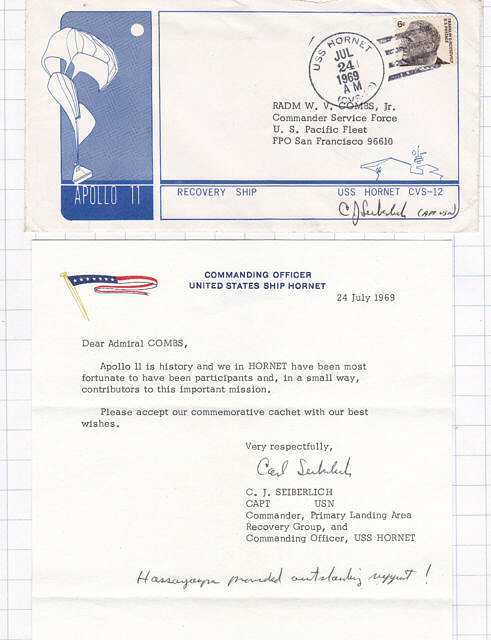 All Captain's covers for this mission were signed by the Captain J. L. Abbot Jr. 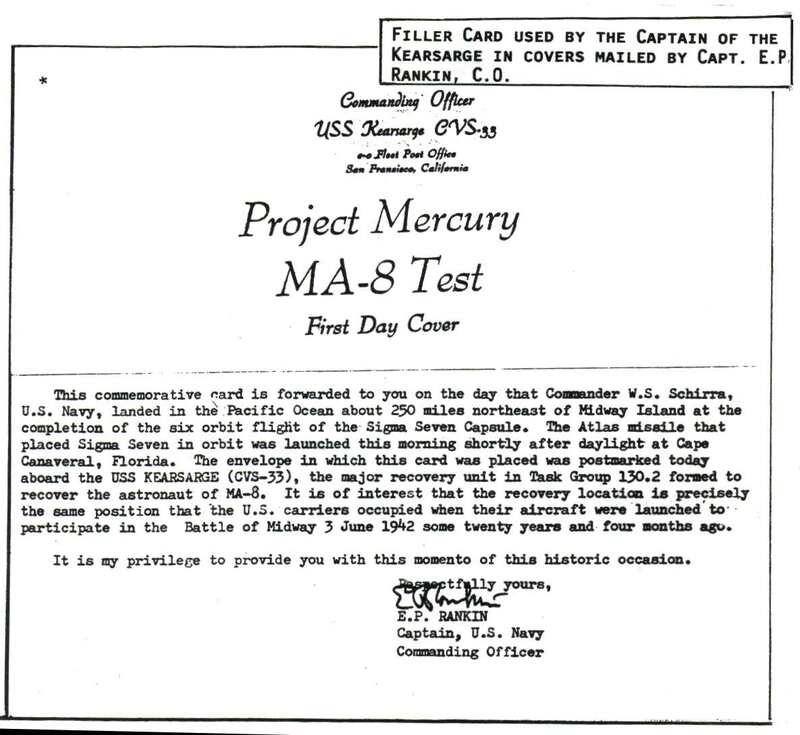 The Captain's cover for this mission is on official ship's stationary with the addition of a specially designed ship's MA-8 RSC. 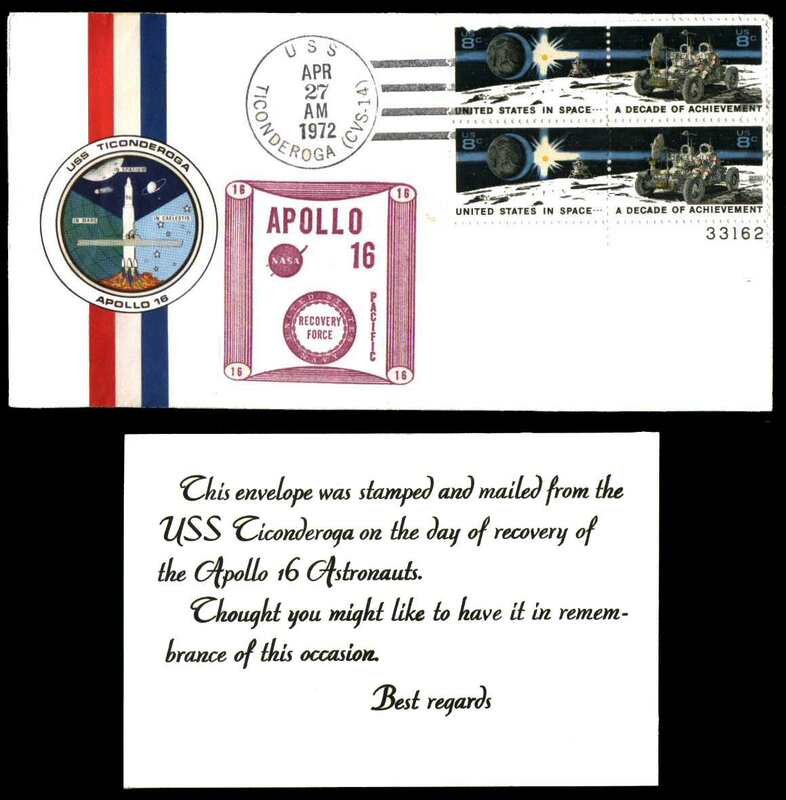 As such they did not require a stamp or postmark, although some were postmarked with a machine cancel. 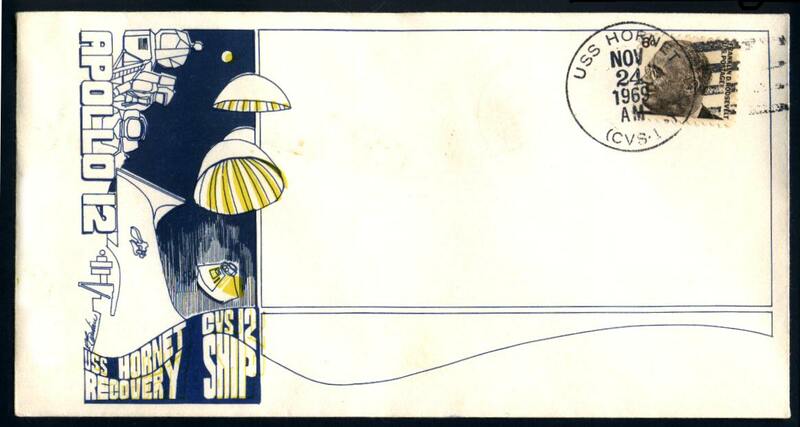 This cover was produced on a plain envelope with the specially designed ship's RSC and the Captain's corner card. 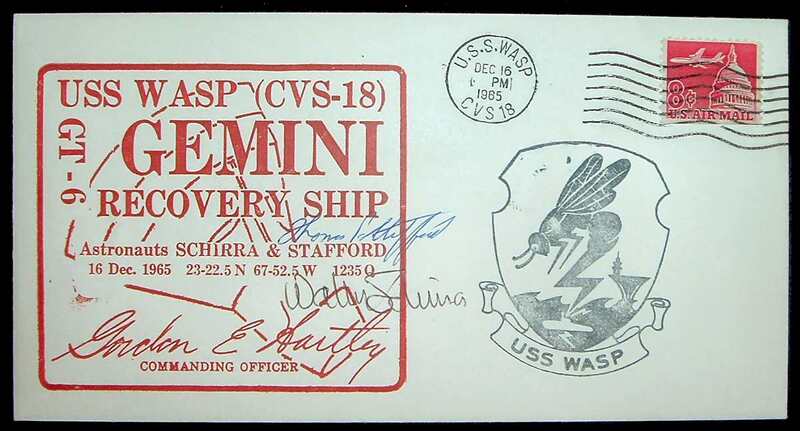 All such covers are signed by the Captain above the corner card. Most have a machine cancel, although one has been sited with a hand cancel over a very faint machine cancel1. Identical to the MA-8 Captain's cover except that the RSC has been redesigned for MA-9. The RSC is black unlike the maroon version used for general covers. Covers with either the hand cancel3a or machine cancel2 are known. Identical to the MA-8 other cover except that the RSC has been redesigned for MA-9. The RSC is black unlike the maroon version used for general covers. 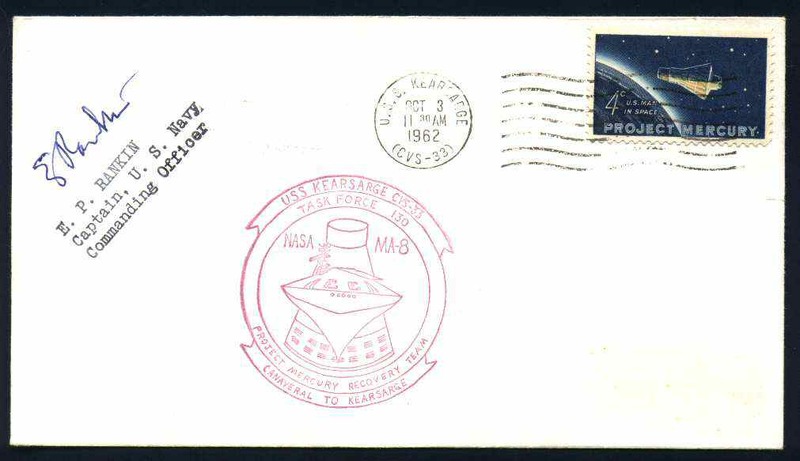 An unusual version exists with a Cape Canaveral postmark. 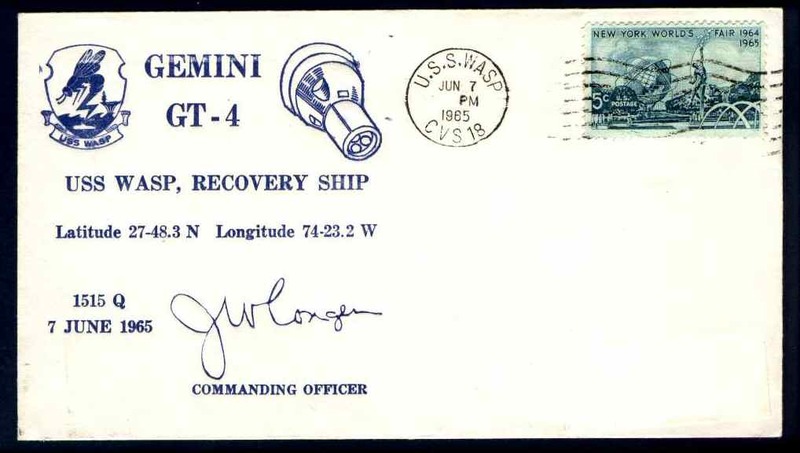 The Commanding Officer’s autograph, J. W. Conger, is and is part of the ship’s cachet. 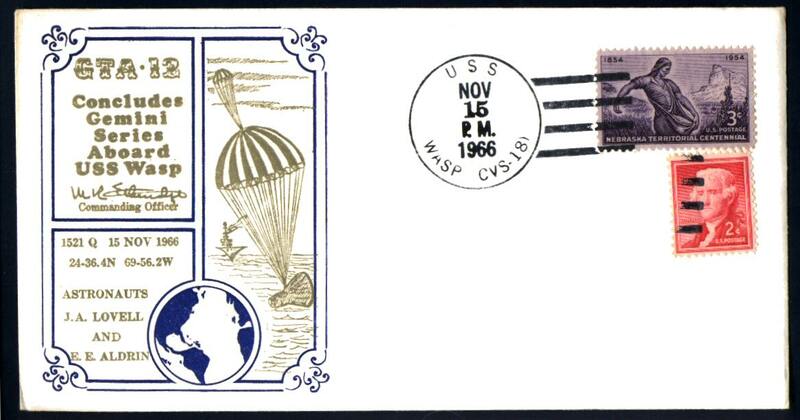 An extremely rare cover prepared for GT-6 and postmarked on the mission’s scrub date of October 25, 1965. 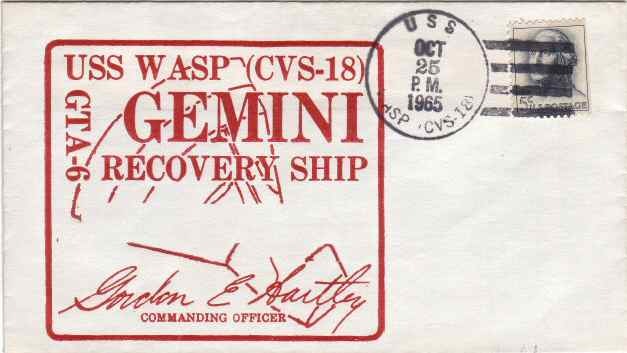 The cover has a autograph of the Commanding Officer, U. S. Navy Captain Gordon E. Hartley. 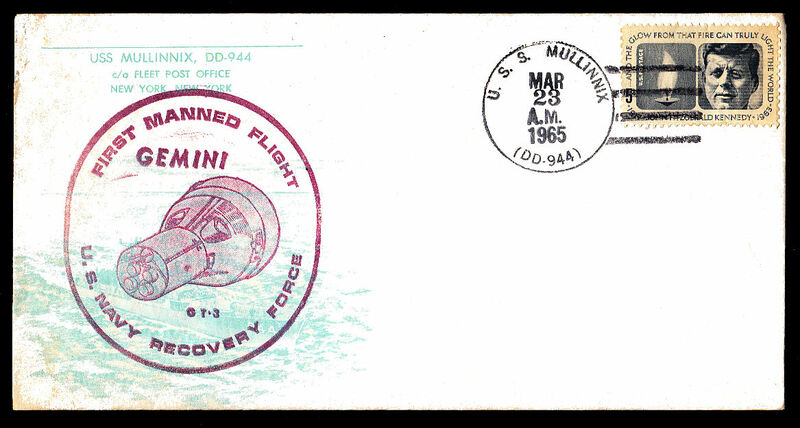 Covers with either machine or hand cancelii are known. It also exists with no stamp. Three different sized covers are known. 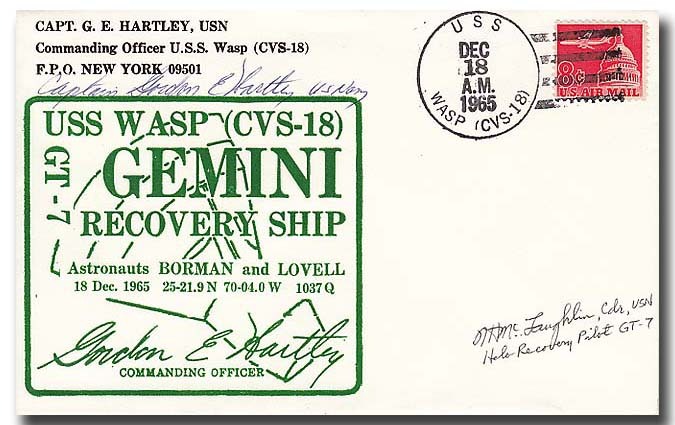 The cover has a autograph of the Commanding Officer, U. S. Navy Captain Gordon E. Hartley. Covers with either machine or hand cancel are known. Both long and standard sized covers are known. 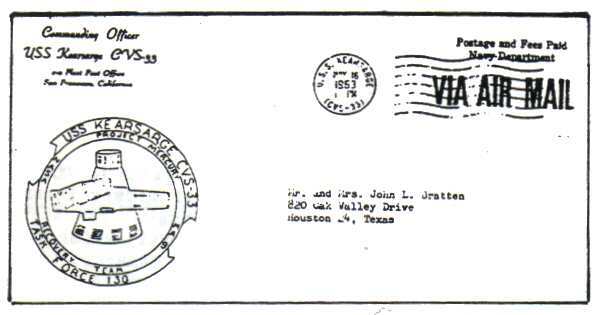 Also 5c and 8c stamps are known. 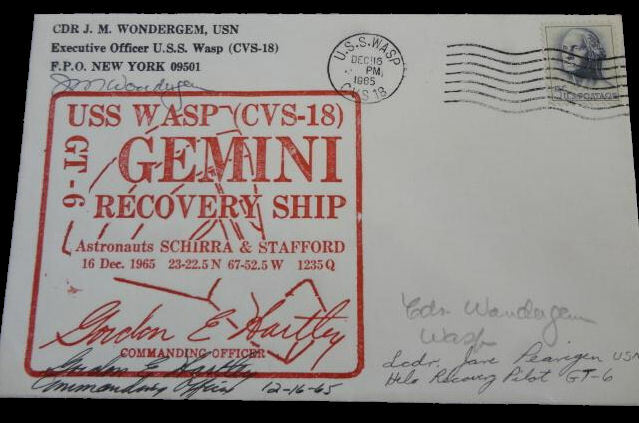 The cover has a facsimile autograph of the Commanding Officer, U. S. Navy Captain Gordon E. Hartley. Uses a 5c or 8c stamp. 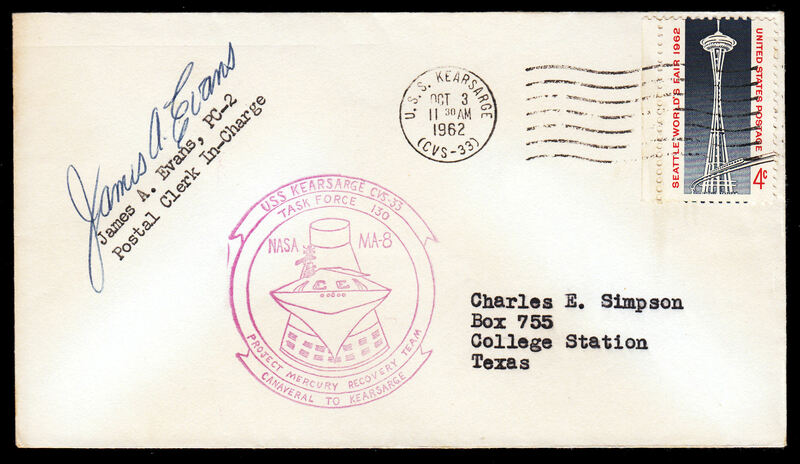 Also on larger envelopes. Sometimes contains a compliments card. 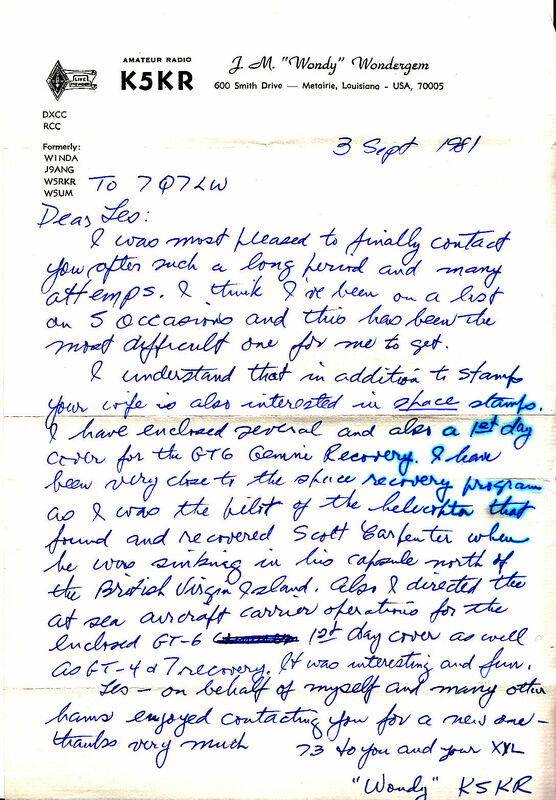 Also see this great one from the Commanding Officer. 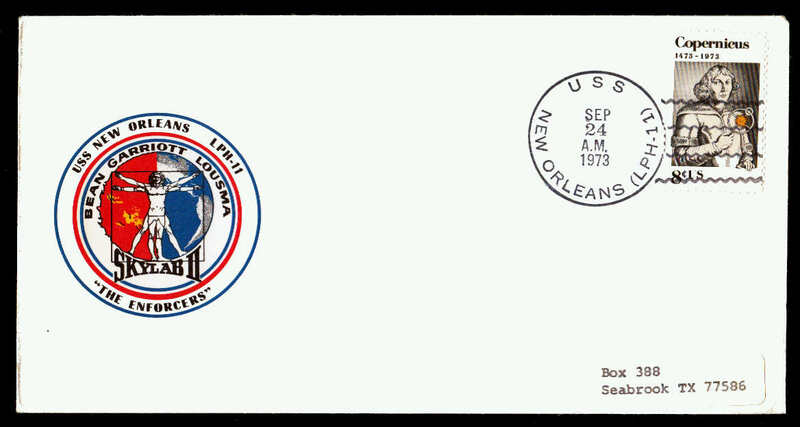 As above but backdated, it uses a 3c stamp. 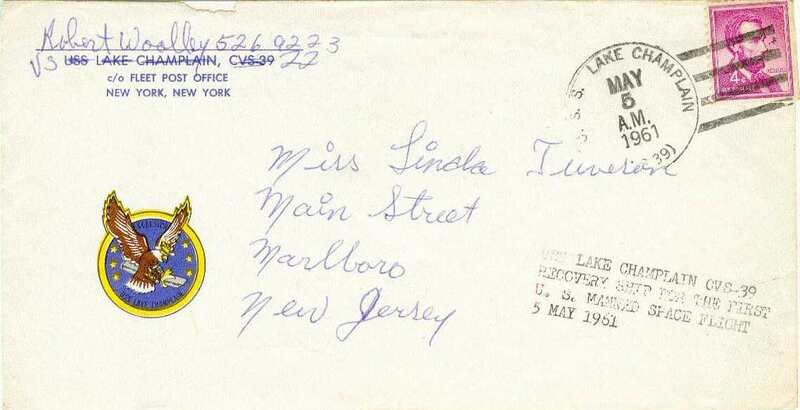 Is this an unstamped Captain's Cover? 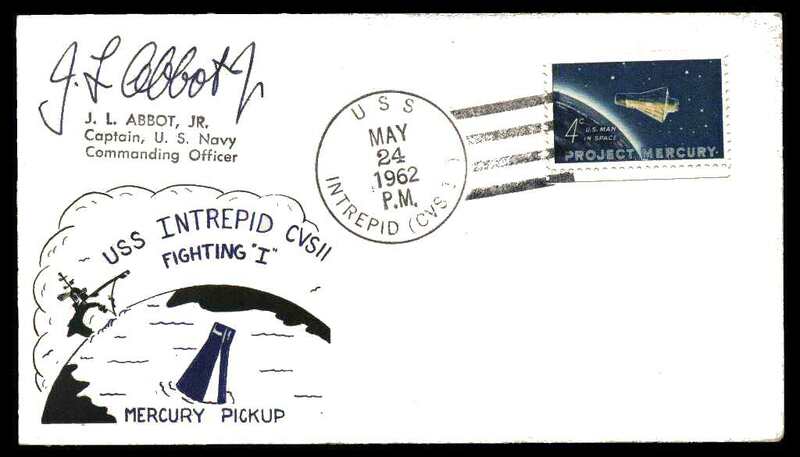 The more common Captain's cover for this mission has facsimile astronaut signatures. 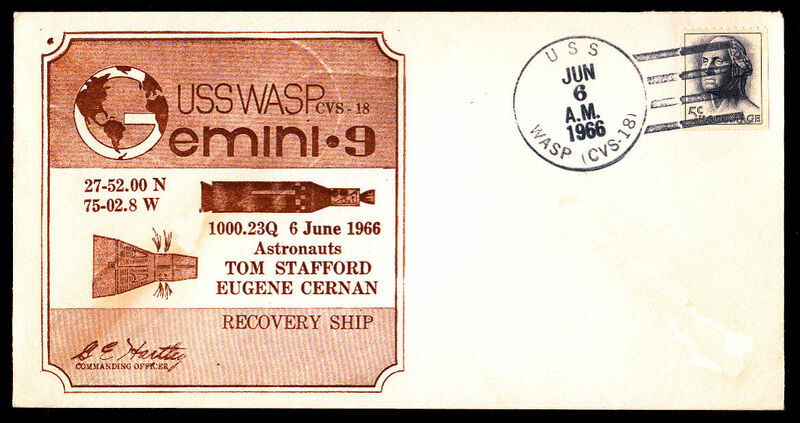 Most are on a #9 envelope but a few are on a #6¾ envelope6. 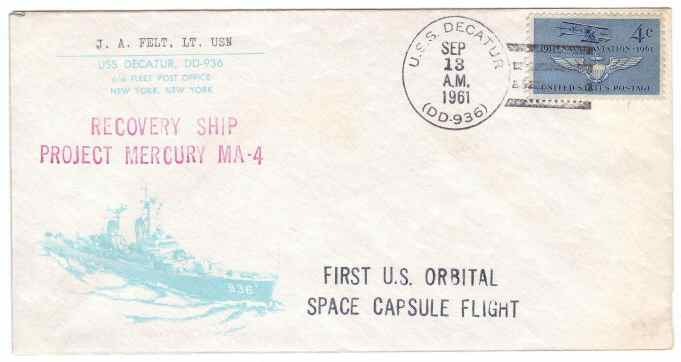 Also known with an airmail stamp and stampless. 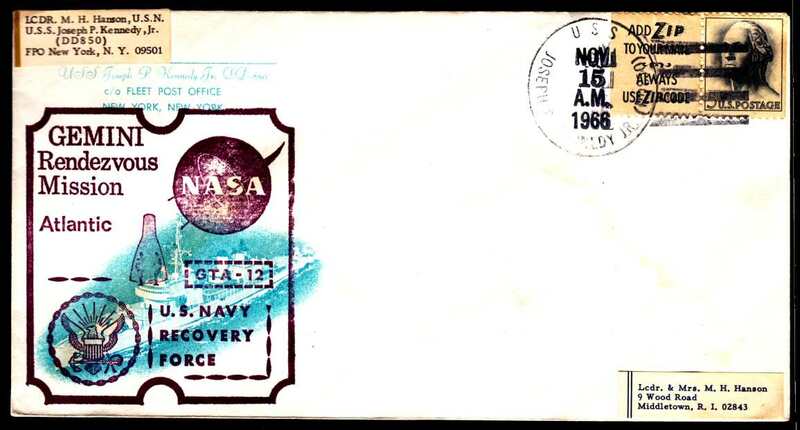 A relatively common variation includes a privately RSC showing the NASA emblem plus three lines of text. 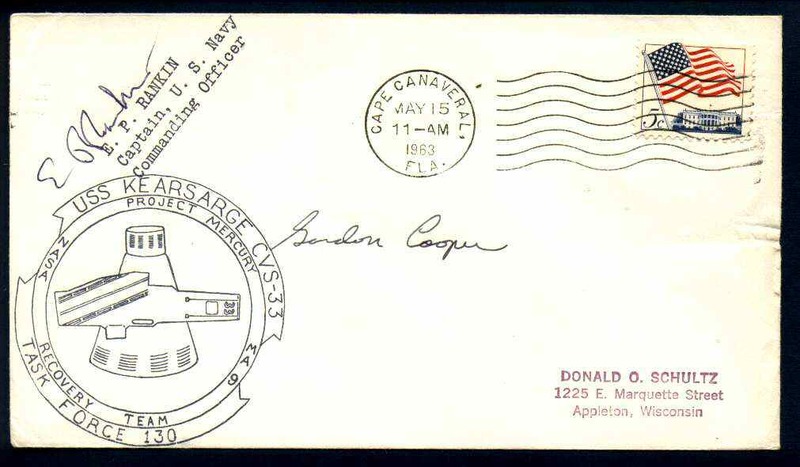 The Captain's cover contains a signature of the ship’s Commanding Officer, M. R. Etheridge, Captain, USN and with a hand cancel. Uses a 5c, 8c or 15c stamp. 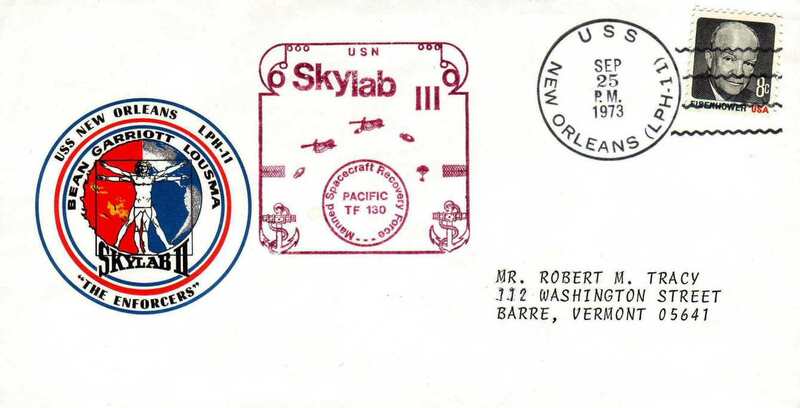 As above but backdated, it has a 3c stamp. It also exists with no stamp. It is unknown whether these were backdated or not. One of the rarest of the Captain's covers. 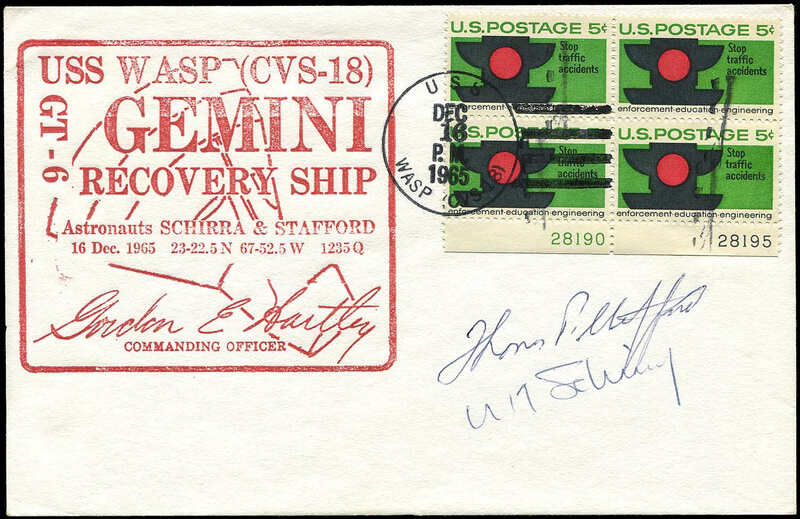 Also with 10c stamp9. 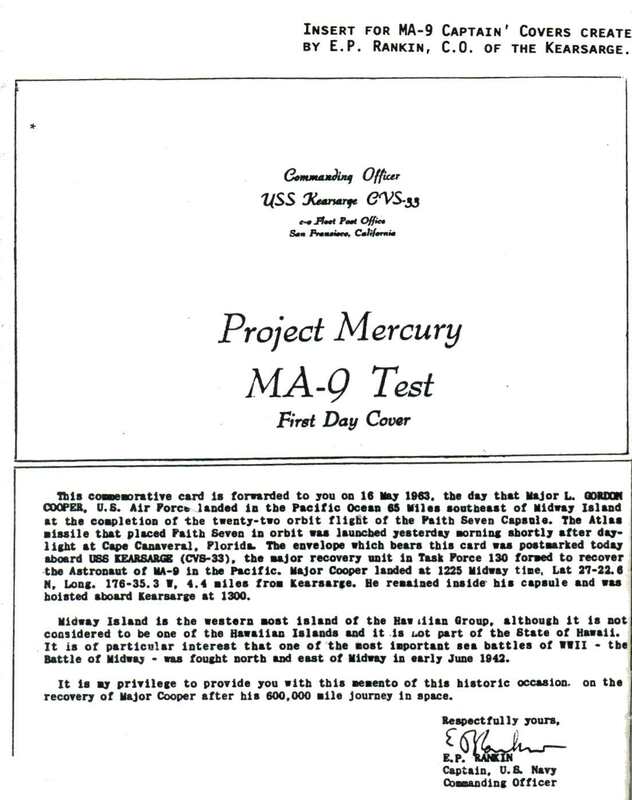 6000 were produced with each crewman receiving two, while the three astronauts, President Nixon and Admiral John McCain each received twenty-five2. Covers exist with a hand cancel and with a machine type 15 and machine type 2 cancels. 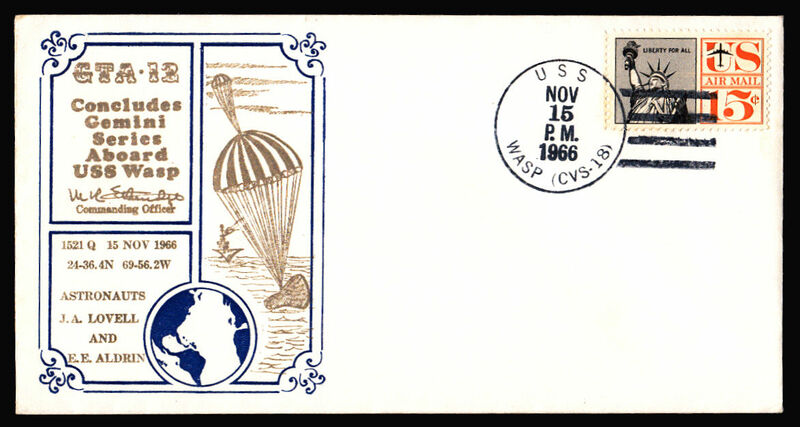 A Captain’s cover was given to each of the 5,000 men aboard the ship as well as press members and dignitaries, but not many of these covers appear to have been mailed off the ship1. Covers exist with hand cancel type 1, hand cancel type 2 and with a machine cancel. 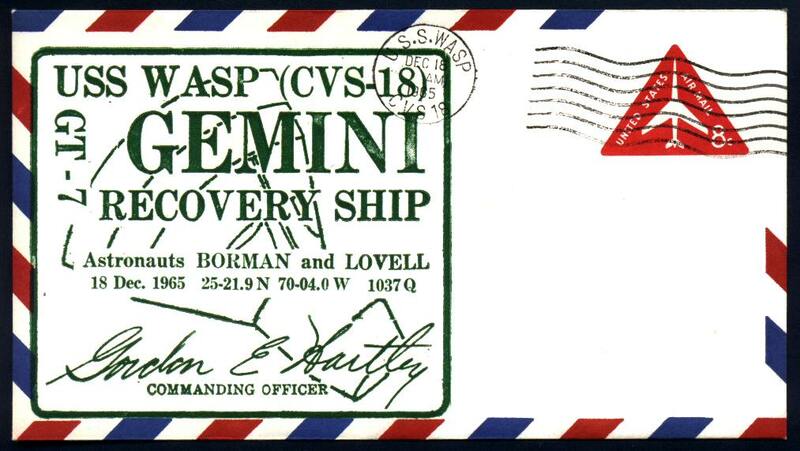 'Space Achievement' stamps were flown out to the ship for use on the Captain's cover2. 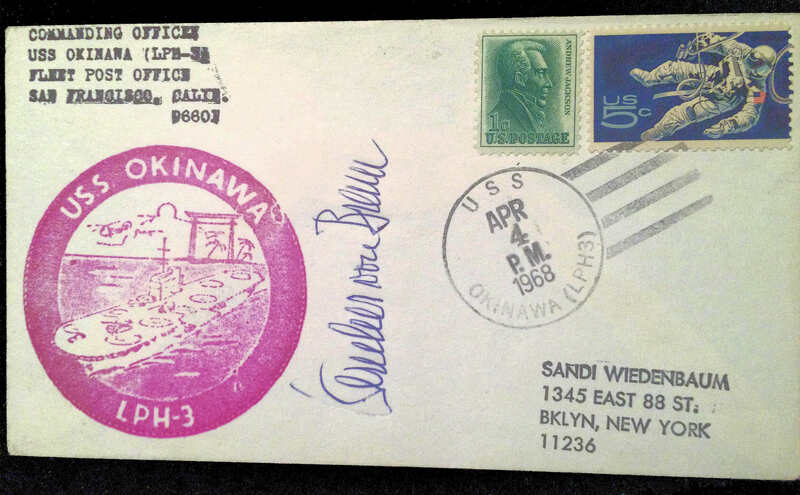 It is unknown if they exist with a postmark with the ship's name on the bottom. Captain's covers exist with a hand cancel from the 19th1 and with a machine cancel from the 20th1. 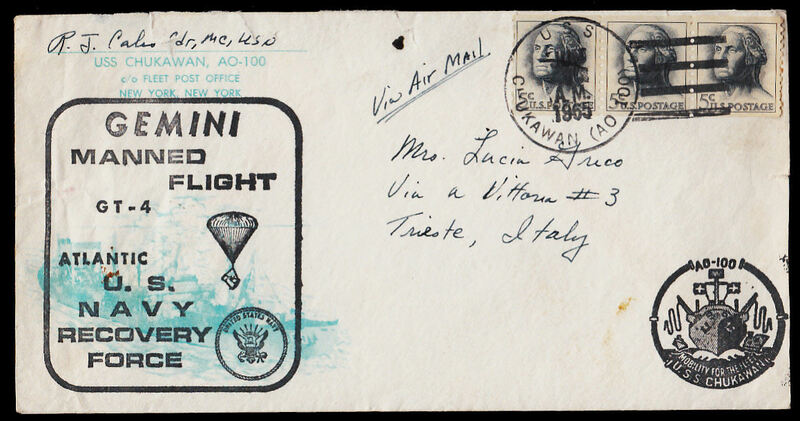 It is unknown whether the covers with a 19th cancel were cancelled on board or in Hawaii. A-6, Monarch and No.10 The A-6 and No.10 versions are known with both hand and machine cancels. The Monarch is known with a hand cancel. GT-6A Special (approx. 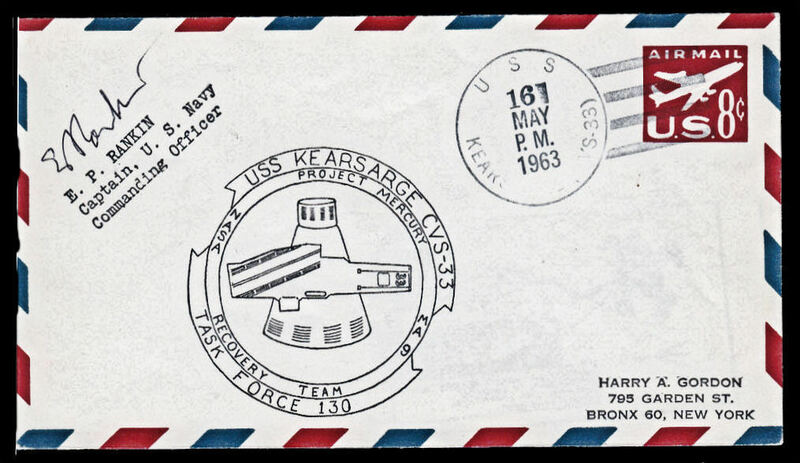 6¾ inches by 4¼ inches) The special covers have a Commanding Officer, Executive Officer or Commander Carrier Division Fourteen corner card and are known with a machine cancel. 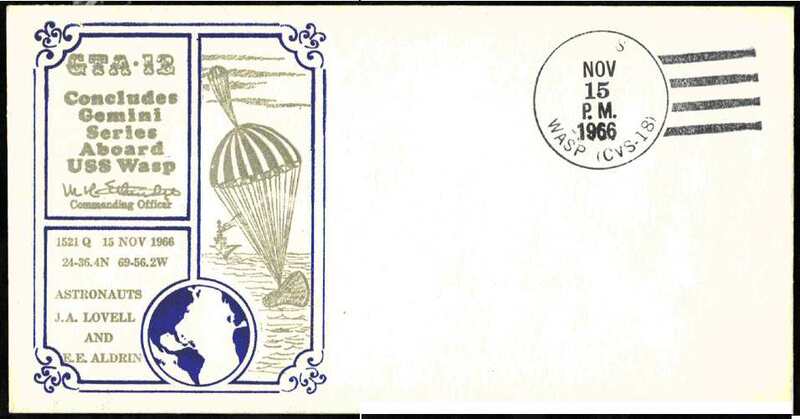 No.6¾, No.6¾ airmail , No.11 The No.6¾ and No.6¾ airmail are known with both hand and machine cancels. The No.11 is known with a hand cancel. Special (approx. 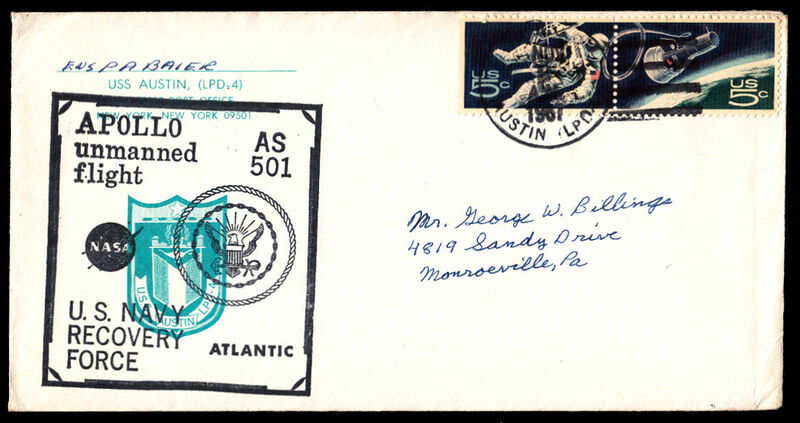 6¾ inches by 4¼ inches) The special covers have a Commanding Officer or Commander Carrier Division Fourteen corner card and are known with a machine cancel. 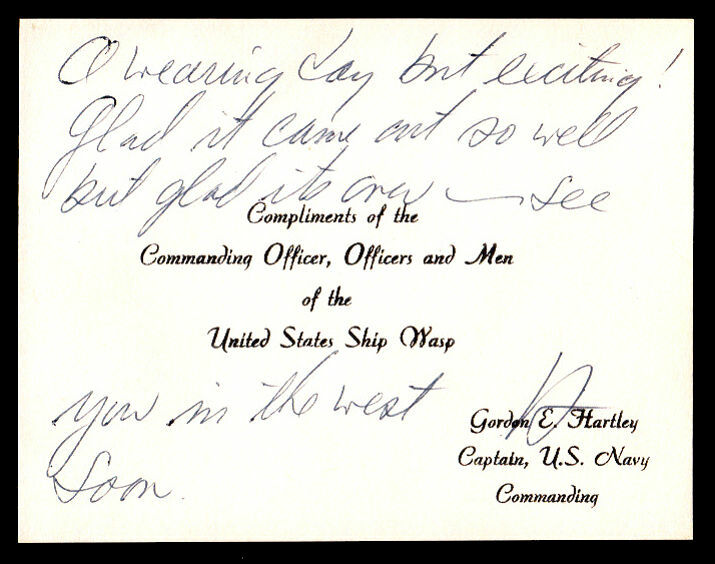 The special covers have a Commanding Officer corner card on the back flap. Only hand cancels are known. GTA-11 No.6¾ and No.9 The No.6¾ is extremely rare. Only hand cancels are known. 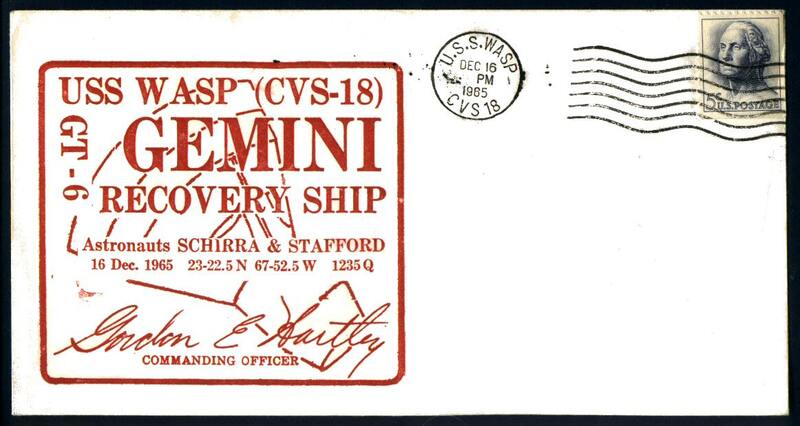 Although sometimes called a 'Captain's Cover' it is a 'Crew cover' as it was available for purchase in the Ship’s Store by crew members.1 it exists with both a dots and no dots postmark. 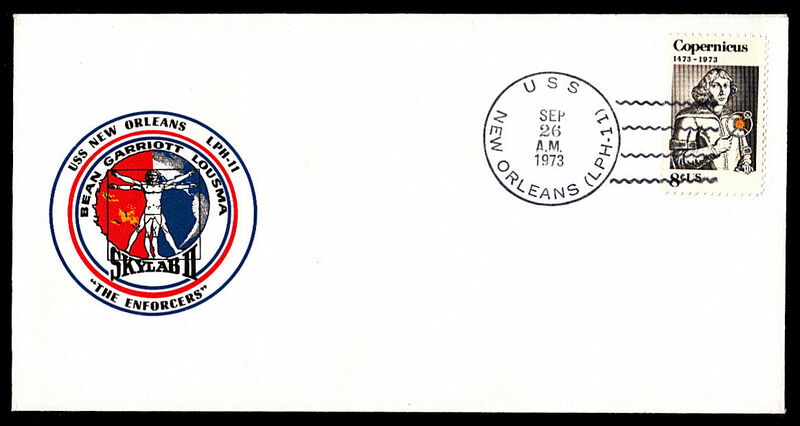 USS Decatur, DD-936, Operations Officer, LT J. A. Felt, produced a cover for the mission using the destroyer’s stationery. He also produced a second cover1 for the mission. 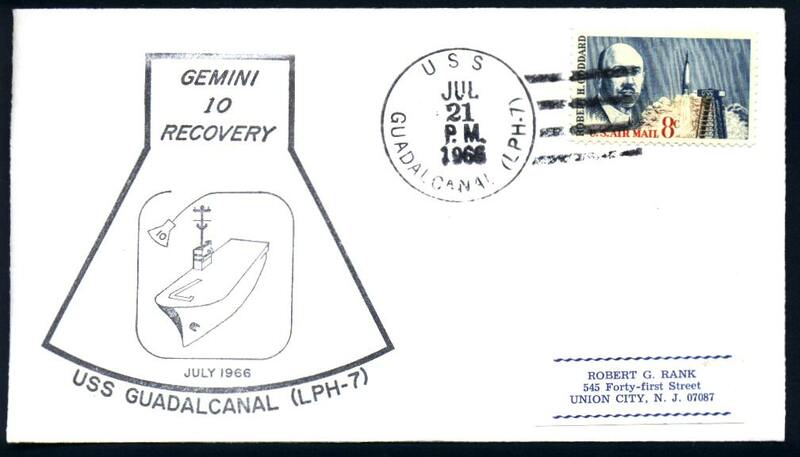 A rubber stamp cover showing the USS Guadalcanal and a Gemini capsule with the number 10 on it's side. 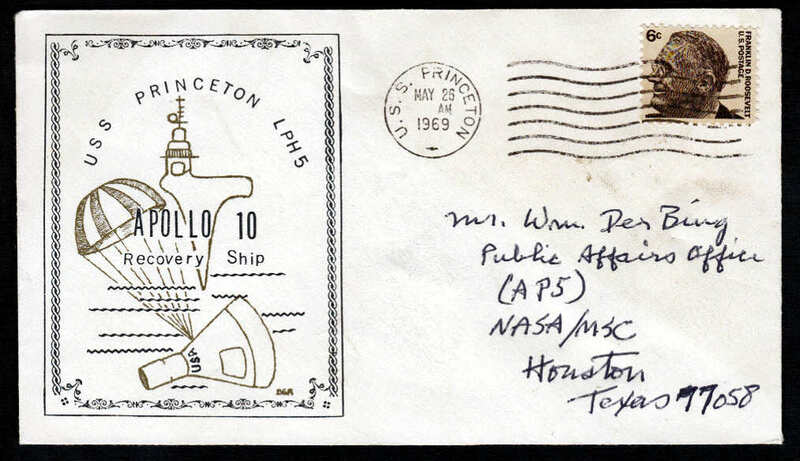 Also found on a long envelope . 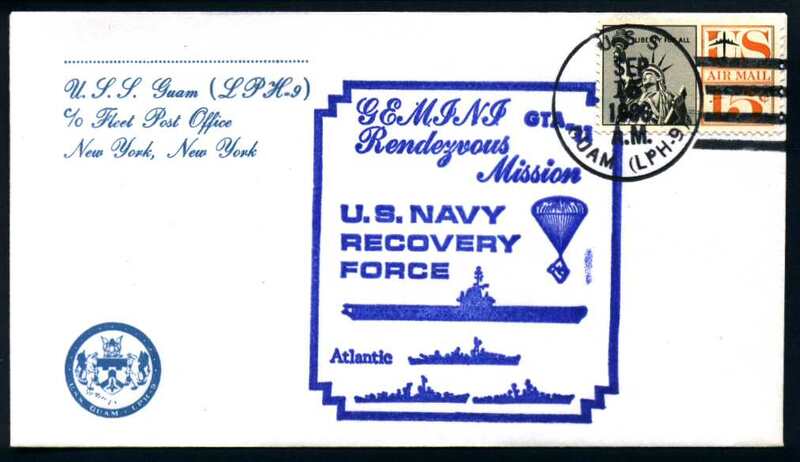 This USS Guam stationery with the ship’s seal and corner card was available to the crew in the Ship’s Store. 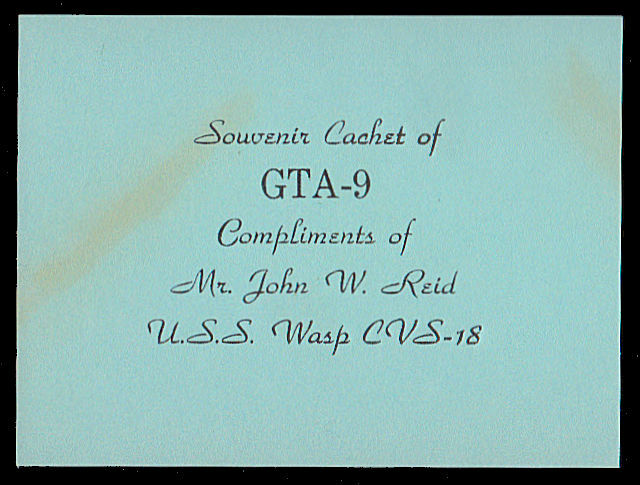 GTA-11 Crew Type 2 Y A different USS Guam stationary. Also know with no stamp. 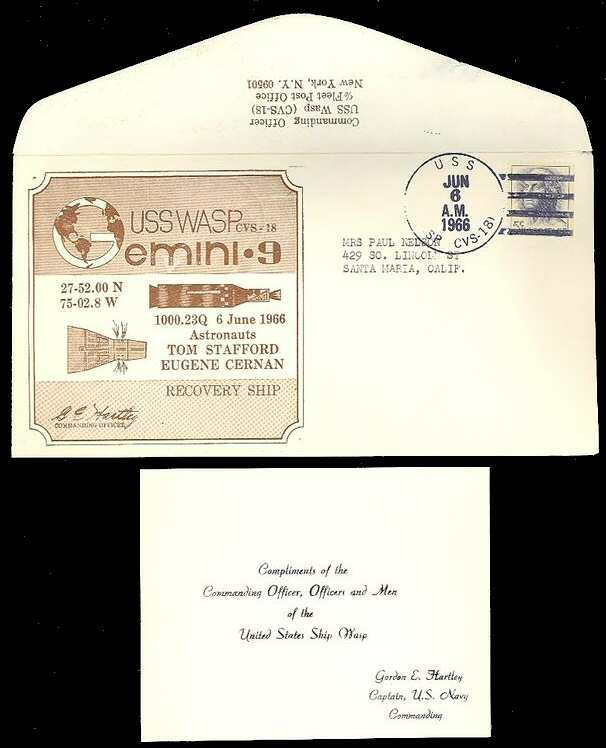 The ship's Sales Officer CWO3 Gene Rinehart , Jr. ordered these covers with an Artopages cachet for the crew’s use during the recovery operation. 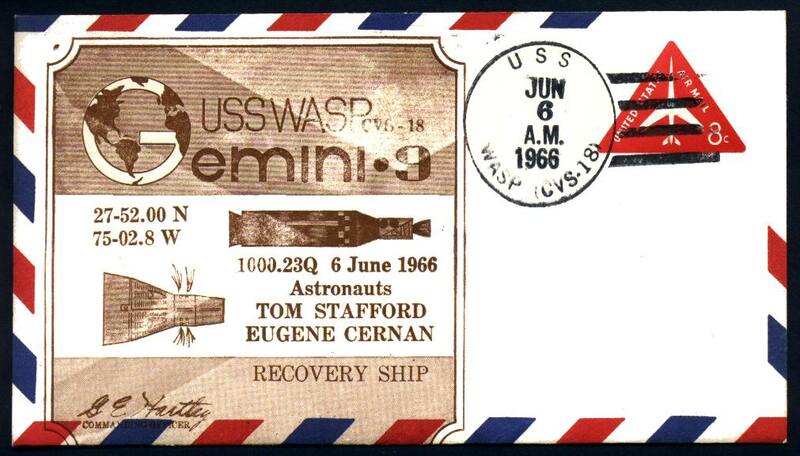 So far all such covers have the ship's name at the bottom of the postmark. 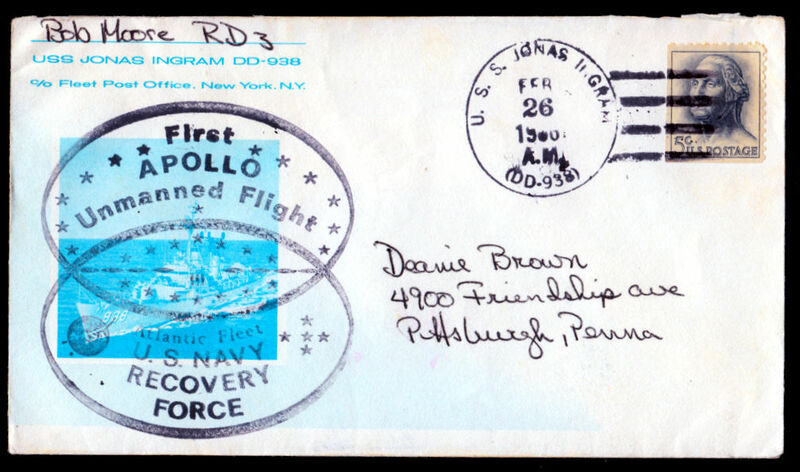 However covers with both normal and skewed postmarks exist. Although sometimes called a 'Captain's Cover' it is a 'Crew cover' it was ordered by the ship's Postal Officer and was available to the crew. Cancelled on the day after recovery. N This was originally thought to be a Captain's cover. However, recent evidence shows it is just a well done PRS cover. 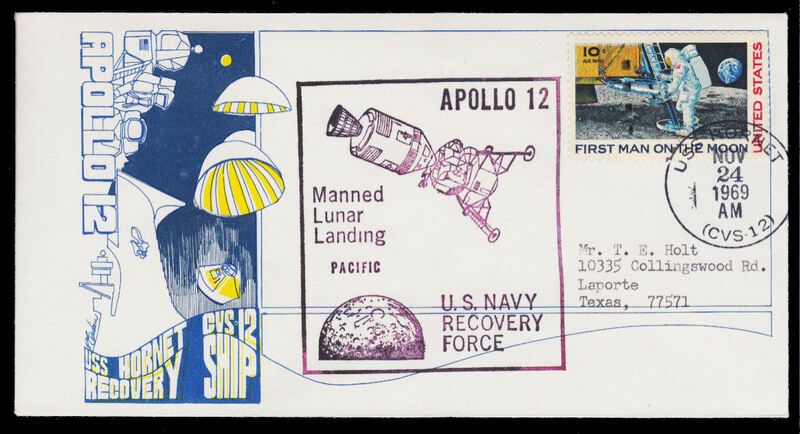 It is believed that the Lem cachet was produced by Apollo Lem Group out of Nasa Houstoniv. 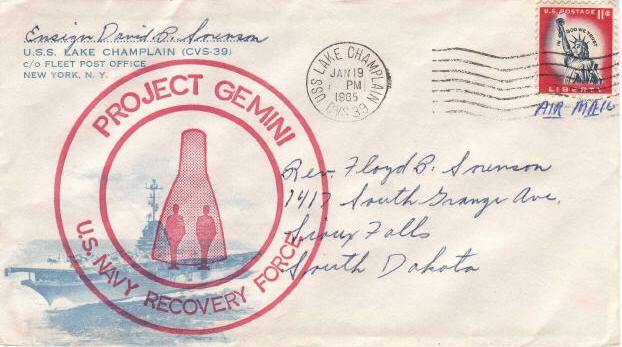 Guadalcanal at top of postmark. Other N This was originally thought to be a Captain's cover. However, recent evidence shows it is just a well done PRS cover. 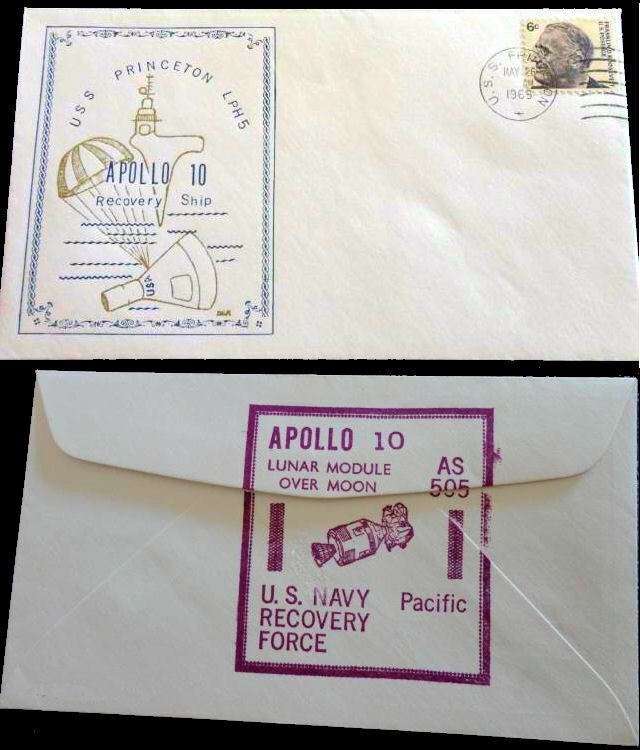 It is believed that the Lem cachet was produced by Apollo Lem Group out of Nasa Houstoniv.Guadalcanal at bottom of postmark. 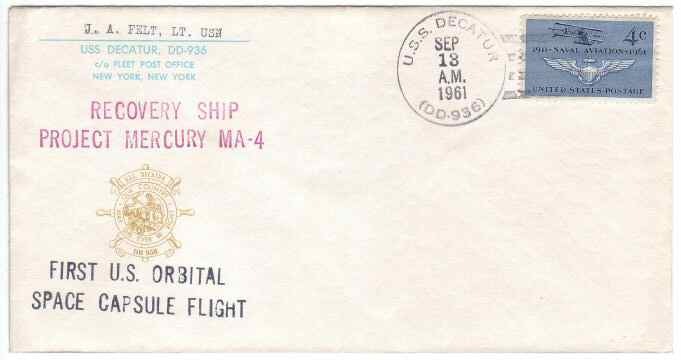 Otheriii N Although sometimes called a 'Captain's Cover' it was brought aboard the ship by a collector. Cancelled on the day of recovery. Although sometimes called a 'Captain's Cover' it was brought aboard the ship by a collector. Cancelled on the day before recovery. Although sometimes called a 'Captain's Cover' it was brought aboard the ship by a collector. Cancelled on the day after recovery. 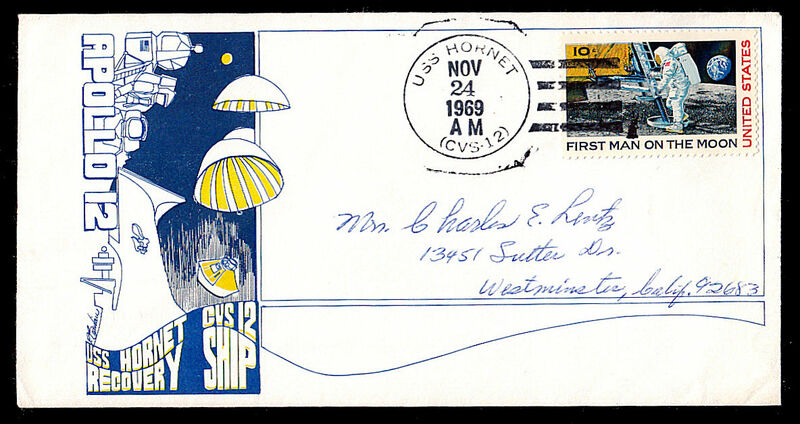 This Captain's cover also has the addition of the ship's cachet making for a very nice cover. 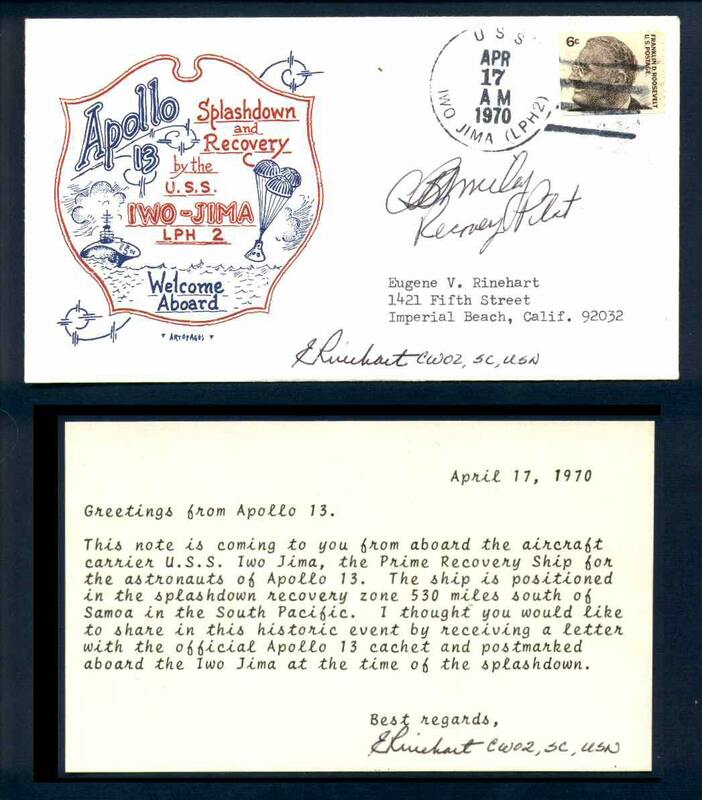 It has also been signed by the two Astronauts involved in the mission. 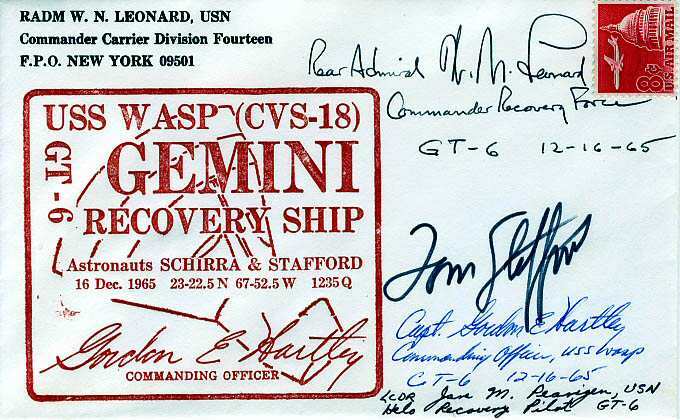 A possibly unique Captain's cover signed by Tom Stafford, the ship's Commanding Officer, the Recovery helicopter pilot and the Recovery Force Commander. 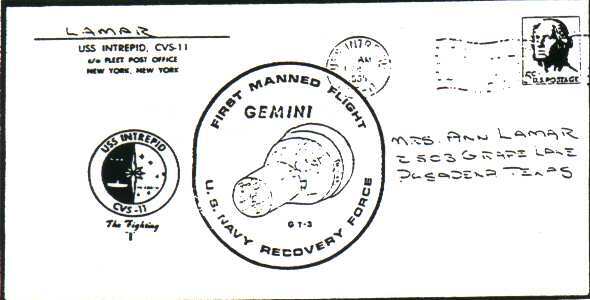 Plus the cover has the Recovery Force Commander's corner card! 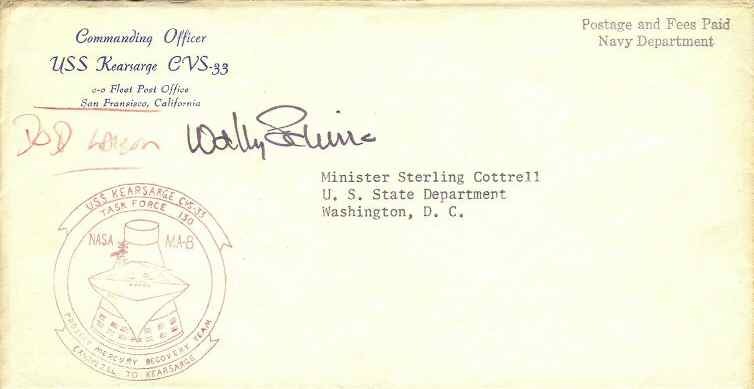 Not postmarked. 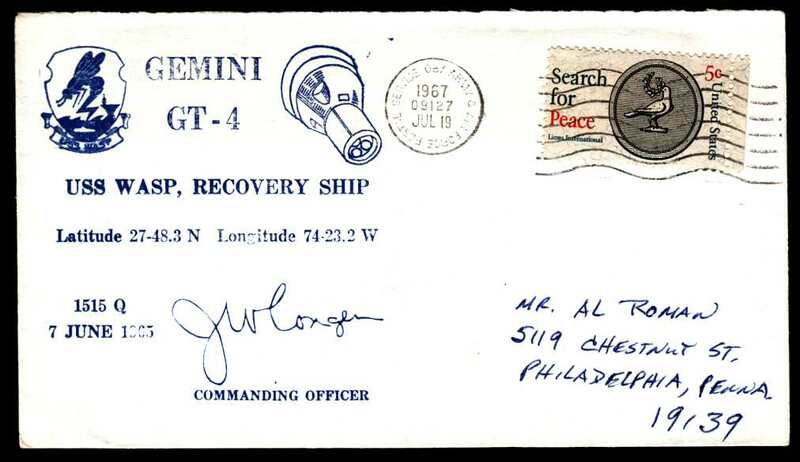 Gemini 6A Captain An ususual Captain's cover with the Executive Officer Cdr J Wondergem's corner card and signed by the him and addressed to the his son. 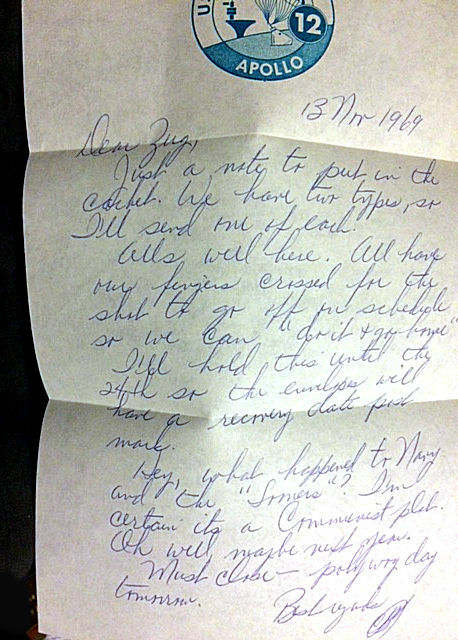 Came with 2 photos (see photo 1 & photo 2) and a letter written many years after the event. A great group of items! 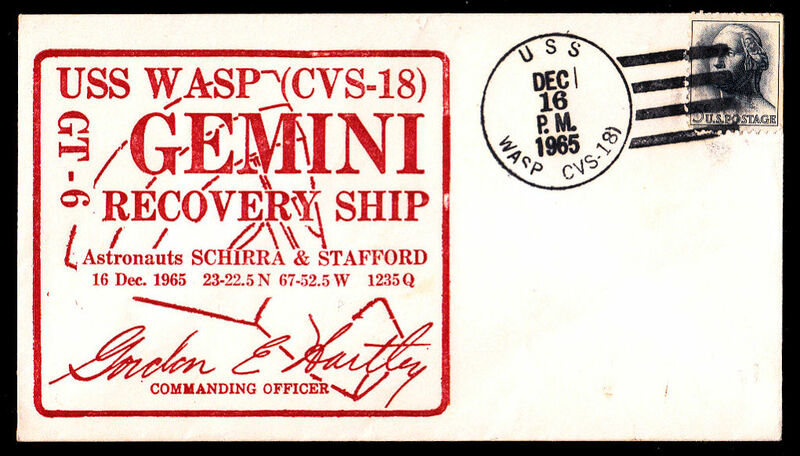 Similar cover to above but also with the signatures of the Commanding Officer and the Main Recovery Helicopter pilot. A great cover. 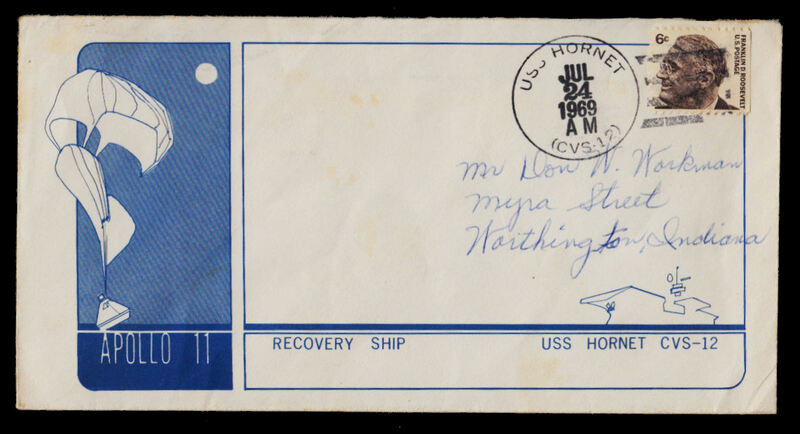 A Captain's cover signed by the ship's Commanding Officer and the Recovery helicopter pilot. 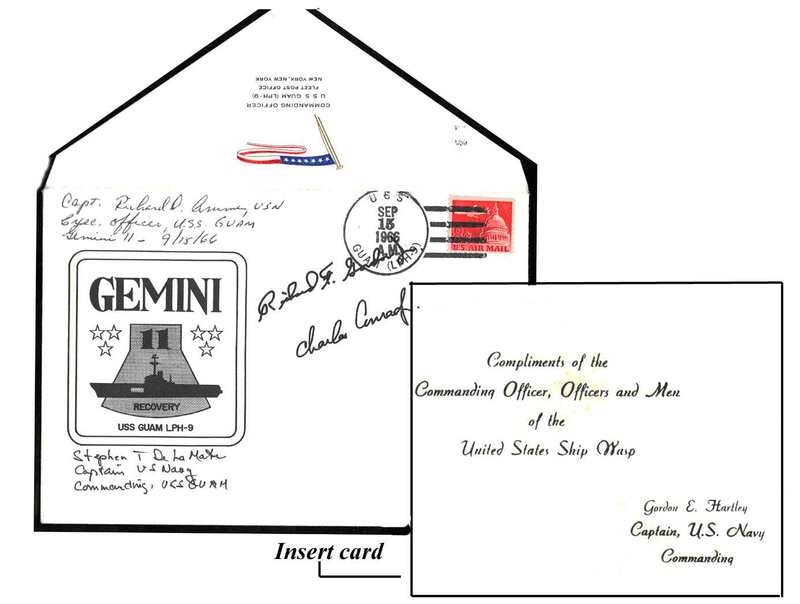 Plus the cover has the Commanding Officer's corner card! Hand cancel. 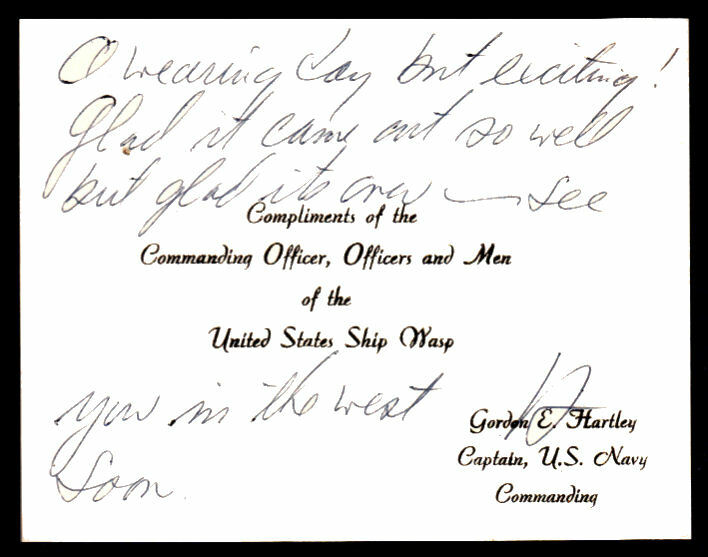 Larger than average Captain's cover has the Commanding Officer's corner card, signature plus an enclosed Compliments card with a personal message. Machine cancel. 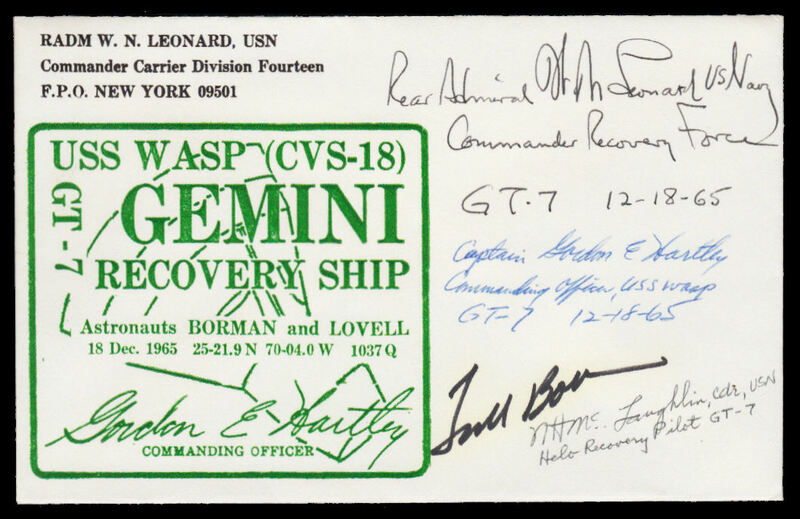 Great cover with Commander Carrier Division Fourteen corner card and signed by the Admiral and others including Frank Borman. 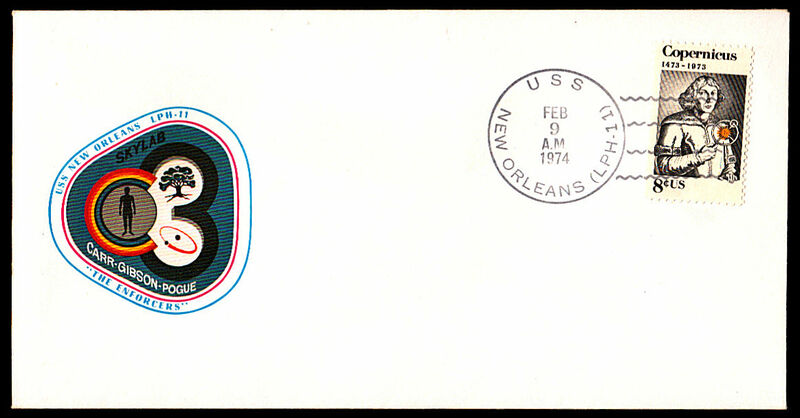 Stamp on back but not postmarked. 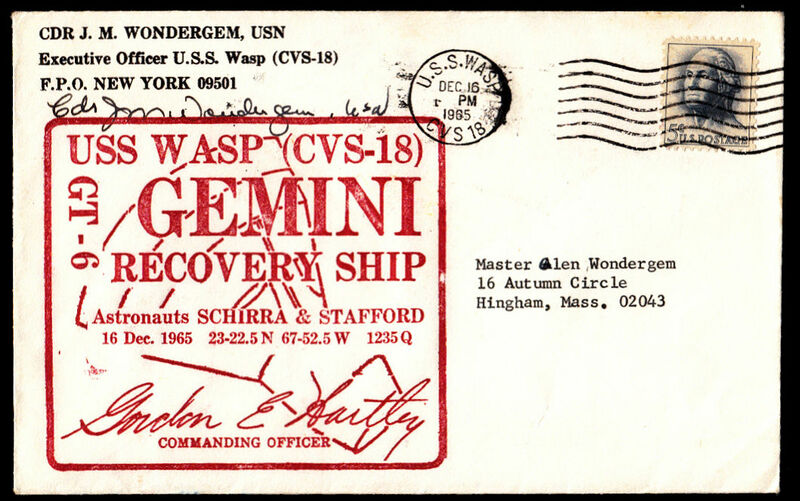 An interesting Captain's cover has the Commanding Officer's return address on the back and with an enclosed 'With Compliments' card with a personal message on the back. 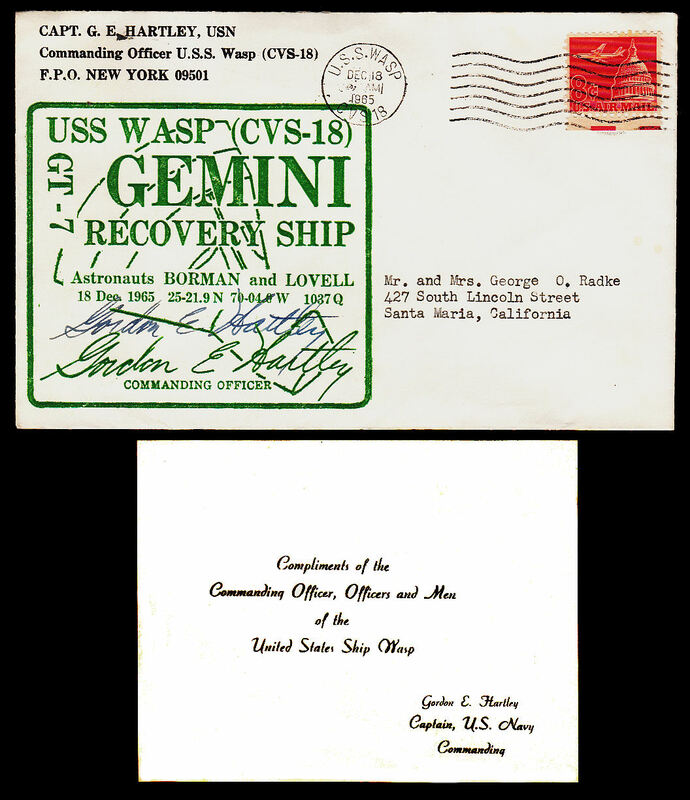 Another Captain's cover has the Commanding Officer's return address on the back and with an enclosed 'With Compliments' card. 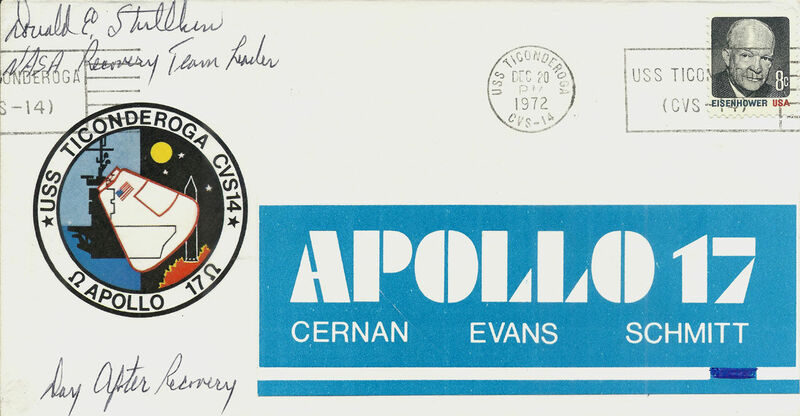 A rare Captain's cover was without the facsimile astronaut signatures and is actually signed by the actual astronauts. 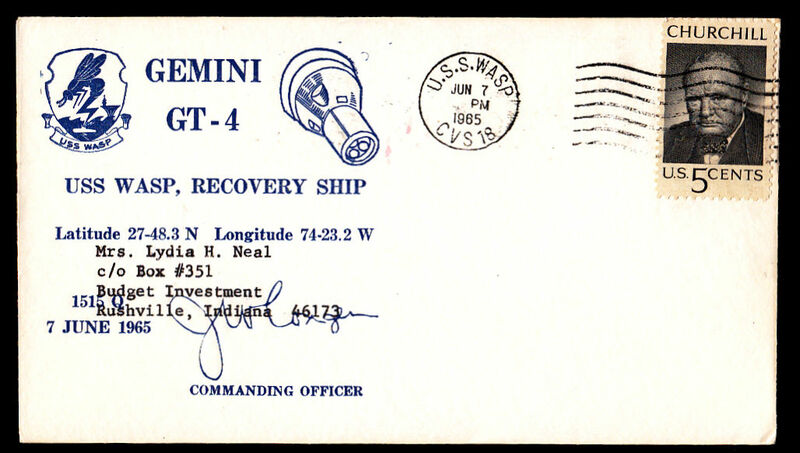 Gemini 11 Captain5d A GT-11 Captain's cover with an additional ship's cachet. Extremely rare. 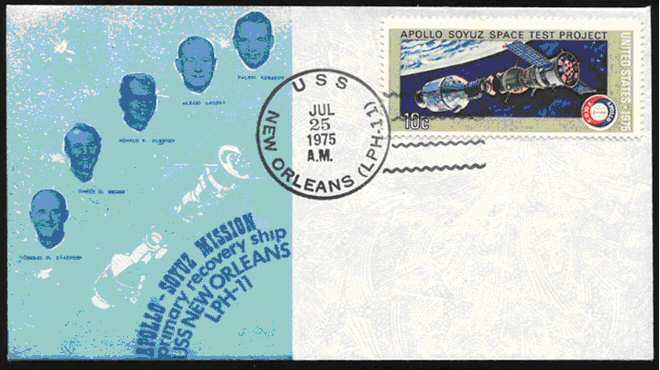 This Captain's cover is signed by the three Astronauts involved in the mission. This is the cover shown in Ray Cartier's handbook. This Captain's cover is extremely unusual (possibly unique) in being postmarked in Pago Pago the day before recovery. An unusual Captain's Cover which includes a rare embossed imprint. The pressure imprint is from the purser's office and reads "DEPARTMENT OF THE NAVY USS HORNET CVA 12" It has the Navy emblem in the middle, and measures 1 1/2 inch across. And the story... 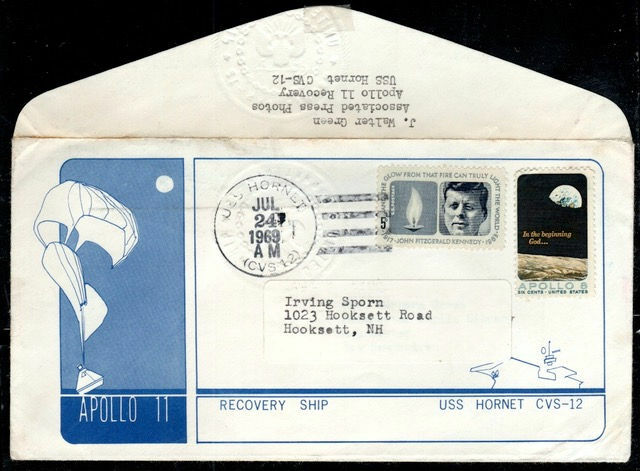 I served on Hornet during both the Apollo 11 & 12 recoveries. 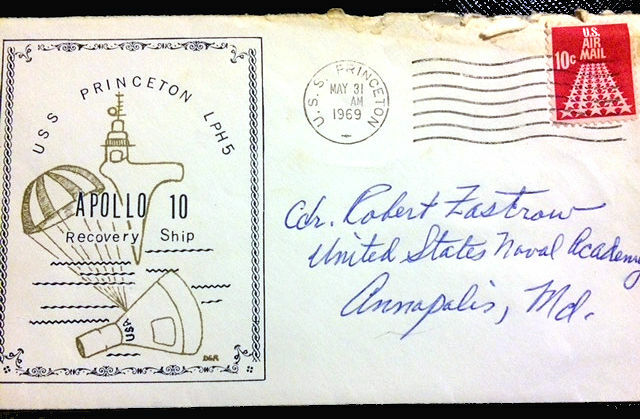 Several of us had Captain's covers processed in the ship's post office. I had a friend in the purser's office who thought it would be interesting to also have the pressure stamp included. This letter from the Executive Office is interesting in that it mentions the number of Captain's covers is 3000. 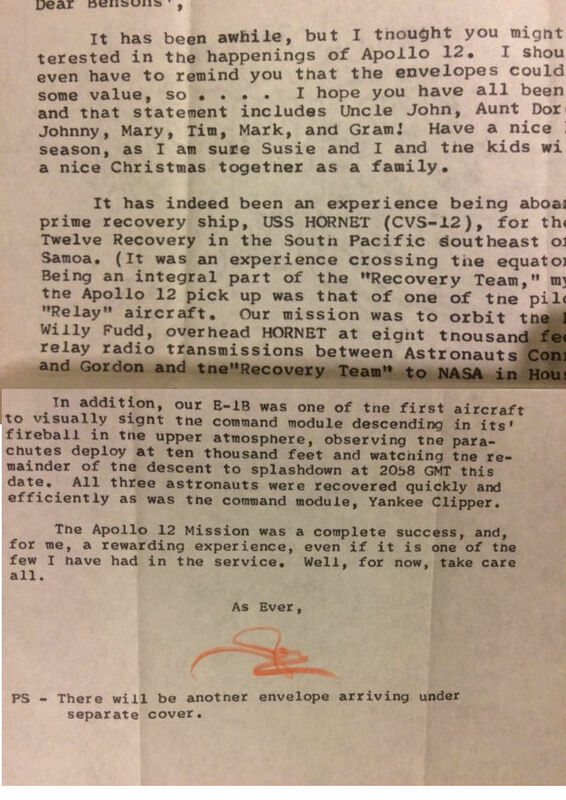 Apollo 12 Letter9 A letter from a member of the crew on ship's stationary. 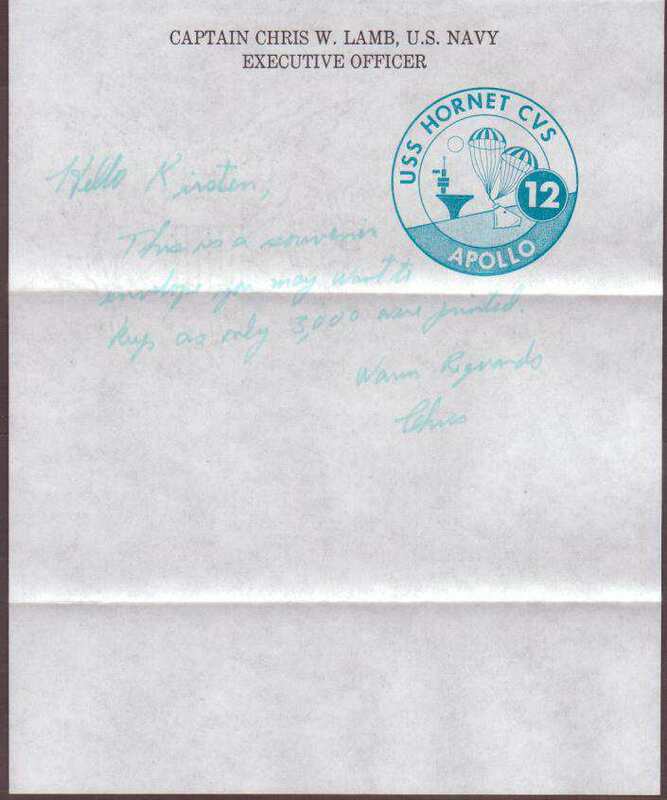 Apollo 12 Letter9 A letter from a member of the aircraft spotting the Apollo 12 capsule. i ) The status of these covers is uncertain. They were produced in reasonable quantity, are consistent and are signed by the Captain. However, it is unknow who ordered their creation and how they were distributed. 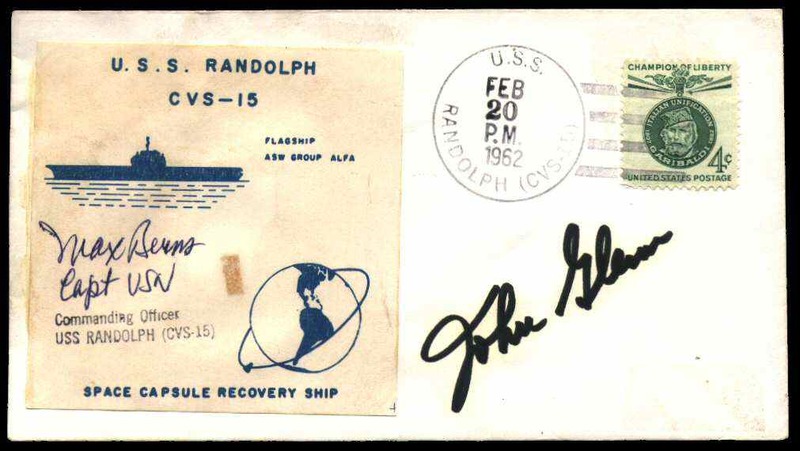 As I have an identical cover , except it is signed by the Postal Clerk, it seems likely that they should be classified as Crew Covers Type 1. It could also be argued that it was a Captain's cover Type 2.
iii ) These were produced by Dr Reuben A Ramkissoon. See correspondence with him. 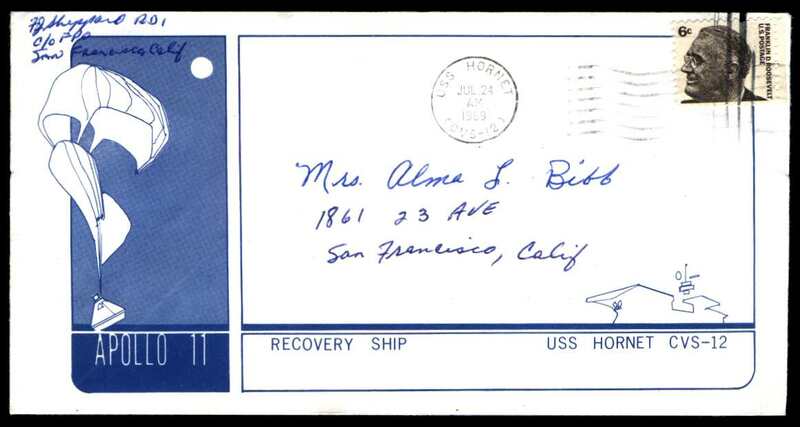 vi) Note that the cachet was not added to a blank envelope but was added after the envelope was addressed. 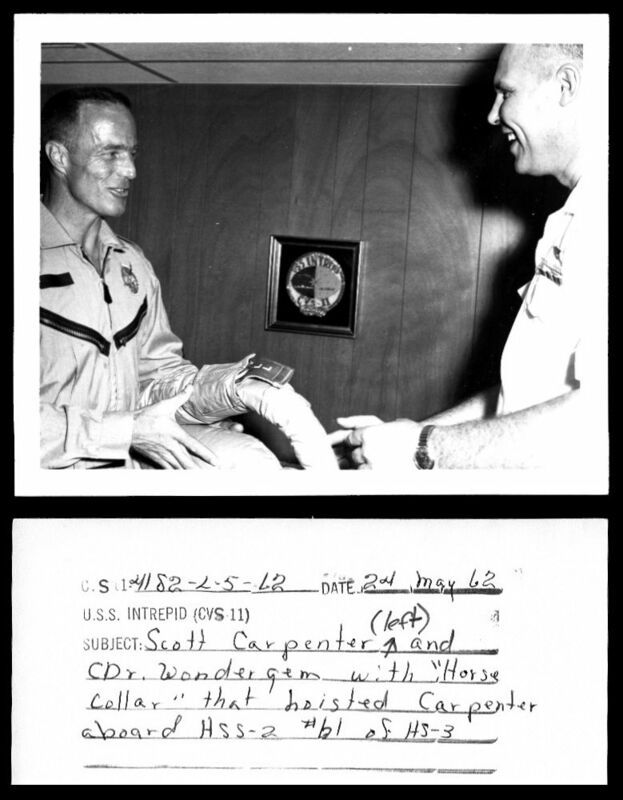 vii) Wondergram was the Executive Officer of the USS Wasp for Gemini 6A and previously was the pilot of the helicopter that recovered Scott Carpenter during Mercury 7. 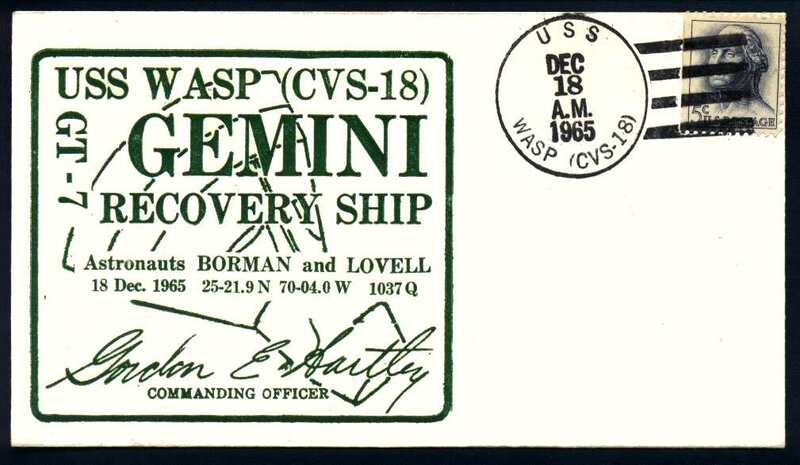 He also directed aircraft carrier operations for Gemini 4, 6A and 7. 3) From the collection of Dennis Dillman. 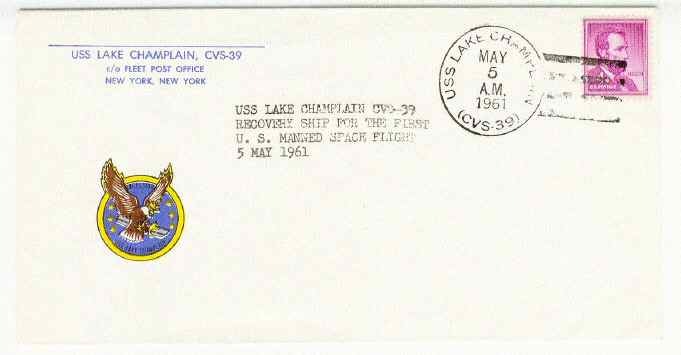 Such covers also included a MA-8 or MA-9 card from the Captain2. 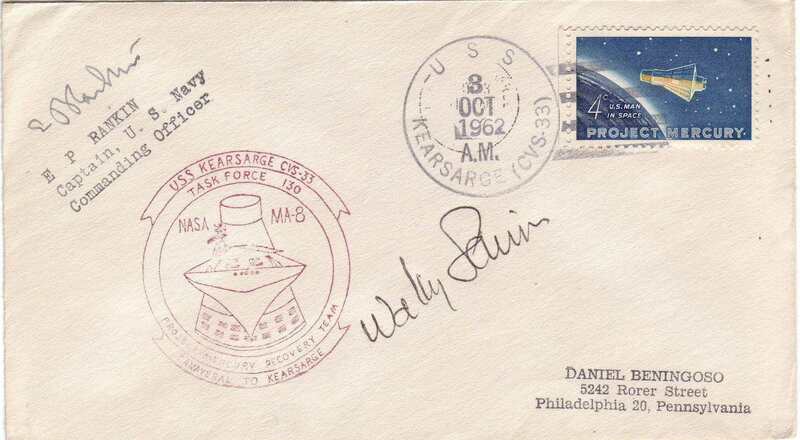 3a) From the collection of Dennis Dillman.